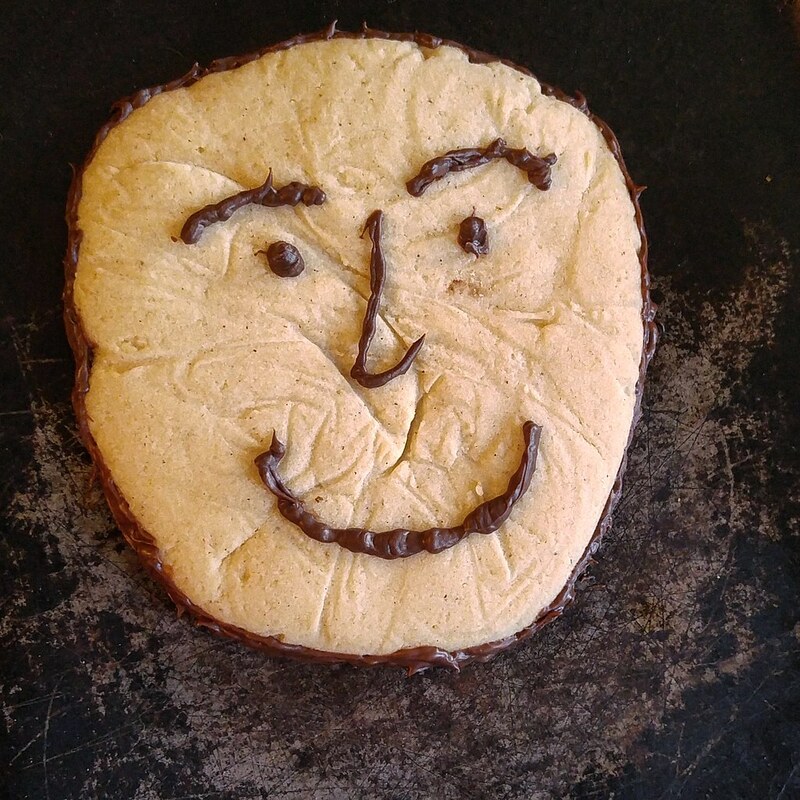 Why is this shortbread cookie smiling? He's both gluten free and vegan, and tastes divine! While I'm glad to see 2018 arrive, the end of December is always a bittersweet time for my sister and I. Every year, my mom donates exactly one month to shortbread cookie baking, and once January 1 rolls around we pack up the cookie cutters and sprinkles for another year. While we gripe and complain about the dearth of melt-in-your-mouth, buttery goodies the rest of the year, I can appreciate that the adage "absence makes the heart grow fonder" really holds true in this case. Alas, not everyone on my gift list is able to appreciate such decadent cookies. I speak of course of my friends with Celiac and food allergies - namely dairy, nut, soy and egg. The original cookie contains a short list of ingredients - flour, butter, icing sugar, egg yolk and vanilla - so finding workarounds that didn't compromise the pure flavour of the originals was tricky. Most margarine contains either dairy or soy (or both), and while I do have a recipe for a vegan "egg yolk" substitute I needed something quick and easy. I eventually settled on my Homemade Egg Replacer powder, which worked well and kept the cookies' tender qualities due to it's starch component. For the "butter", I went with a new-to-me vegan spread that was also soy-free: MELT. Usually I would stay far, far away from "spreads" in cookies like this, but the result was far better than I supposed and the cookies didn't have any lingering taste of coconut (the main ingredient). The great thing about this dough is that it freezes well too, so I made a full batch and divided it into thirds (one for each recipient). I got about 10 cookies per mini-batch, which I either decorated with chocolate or painted with food colouring. 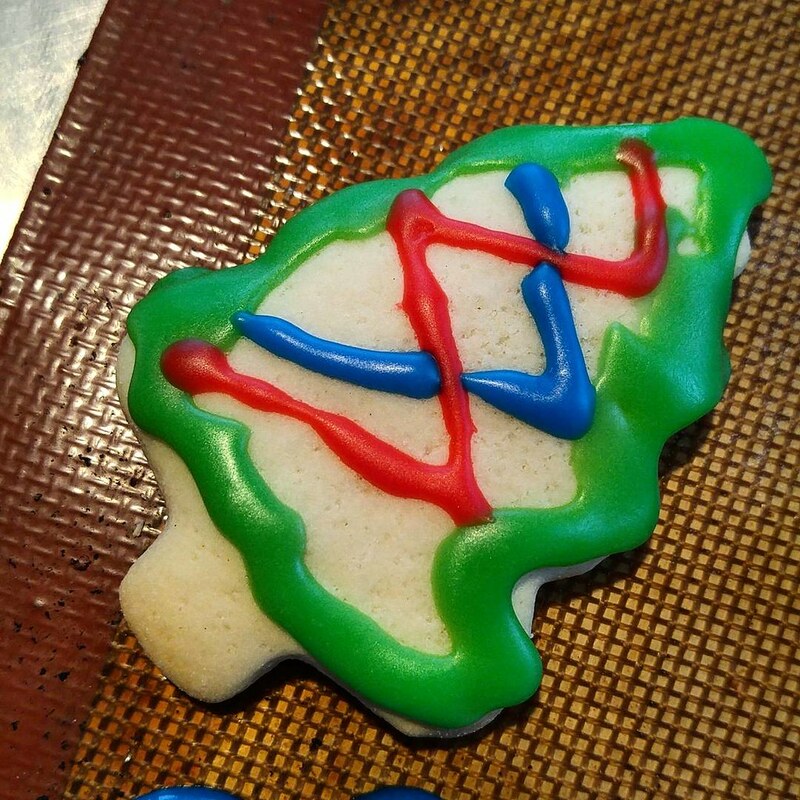 Do you have a special holiday-only cookie? Let me know in the comments! Scottish Fan Cookies are a slightly puffy, crisp spiced brown sugar biscuit decorated to resemble a fan. A sprinkle of raw sugar adds a bit of crunch! These cookies have been on my "bucket list" for the longest time - I think I had read the page in my mom's cookbook about 20 times since finding it in 2010(ish). For some reason, it never made it to the final cut, until this year. With a slightly "laxer" schedule due to less commuting and online school, I had the opportunity to make bits and pieces of my Christmas cookie list over a few weeks - a huge benefit because I could allow for proper butter softening, dough chilling and even decorating! That said, these cookies are relatively low on the "complexity scale" when it comes to cookies - it's a fairly basic brown sugar and spice cookie with a touch of barley flour and a couple shots of whisky for good measure. However, the dough needs to chill twice - once to firm up the butter and allow the whole grain barley flour to hydrate properly, the second to make sure the cookies hold their shape (and markings) in the oven. Luckily, neither chill is a "hard and fast" rule - I actually made the dough and chilled it one day, rolled and cut it a few days later and froze all the finished, unbaked "fans" until right before I needed to make up the gift boxes. The cookies are not overly fragile, but their rounded edge makes boxing them somewhat complicated. 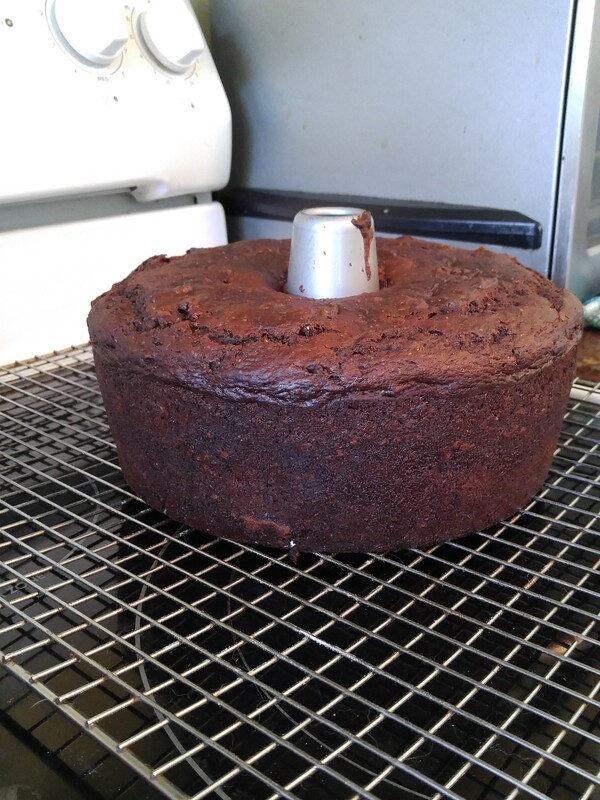 I eventually went for a 6" round cookie tin and placed the baked goods inside in their original configuration. Just be sure to separate layers with parchment or wax paper if stacking in a warm, humid environment (like my well used kitchen), otherwise you'll have one big stack of cookies. Not a bad thing, mind you, but sharing is more appropriate for the season! Norwegian Kakemenn are soft sugar cookies that aren't too sweet - perfect for decorating with icing! They use baker's ammonia instead of baking powder for leavening. Easy and simple tasting, they're a crowd pleaser! I've always loved learning about other cultures and countries, especially when it came to celebrations and (of course) food. My mom has a boxed collection of cookbooks "from around the world", which I love to peruse even though there are no photos. 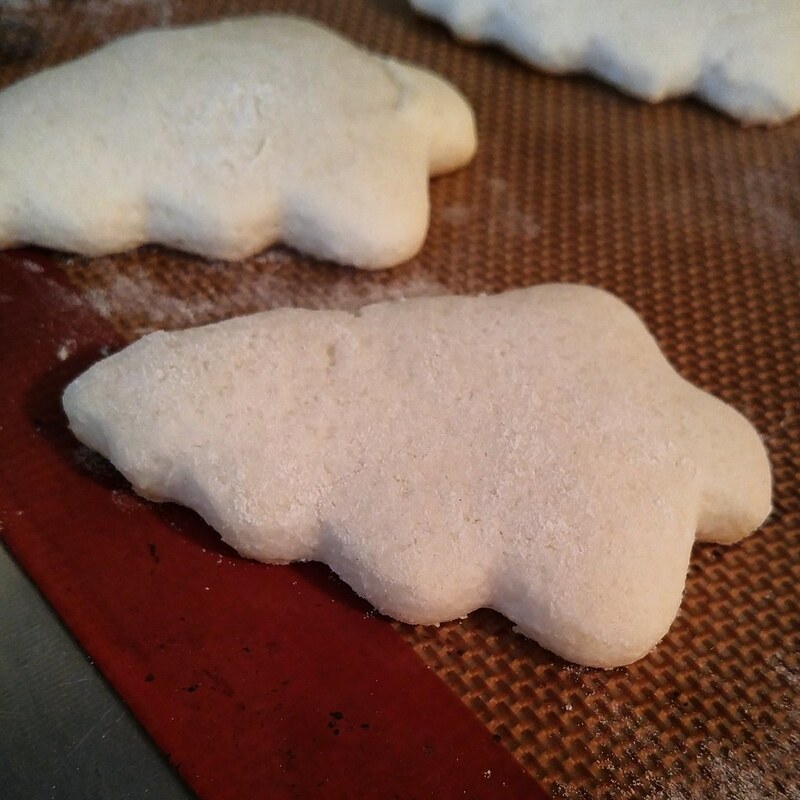 This year I picked a few out of the "British Isles and Northern Europe" book to make for holiday gifts, including these delightfully Michelin man-like Norwegian sugar cookies caked kakemenn. I'm sure you can figure out what the word translates into English as, and let me tell you they are true to their name (even when not shaped like "men"). However, unlike most typical "cakey" cookies that have a soft, somewhat sticky surface and are cakey all the way through, these have a very definite crisp "shell" to bite through before the airy middle is revealed.While I call these "sugar cookies" for lack of a better name, they are definitely not as sweet as traditional sugar cookies are here in North America. They are relatively mild tasting, which is great for people (especially kids) who don't like the typical spice-laden cookies of the season, and since they are intended to be frosted the lack of sweet in the cookie results in a perfect marriage once all is said and done. The cookie dough is relatively unique in my experience, for two reasons: first, the base of the cookie is milk, rather than butter. While butter is a part of the dough, it is melted and mixed with the milk and sugar before adding flour and leavening. The leavening is the second unique part of this cookie puzzle - like the Amoniaczki and Vintage Speculaas that I've made in the past, these cookies use baker's ammonia for leavening instead of baking powder. If baking with ammonia weirds you out - and trust me, when these are baking you'll think you're cleaning your oven - don't worry about ingesting poison. It might smell like bleach at first (and I don't recommend eating it raw!) but ammonium bicarbonate is a fantastic leavener for simple cookies since it doesn't leave any taste behind after it's done it's job! Apparently, you can try to substitute baking powder, but I know you won't get the same airy crispness of the original. Do you like trying out new cookies every year for the holidays? What are some of your favourites? 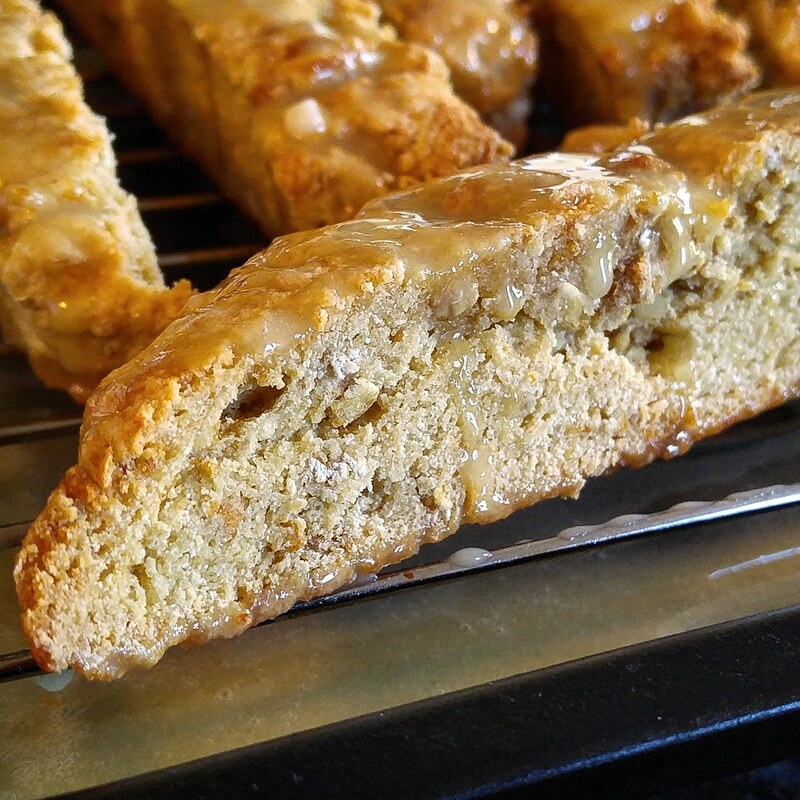 If you like pina coladas, these biscotti are right up your alley! Made with coconut flour, pineapple juice and a shot of spiced rum, they're perfect with a fruity tea or on their own. These cookies are another contribution to my holiday biscotti collection this year. While we haven't yet been hit with the icy blast of winter (knock wood), it is cold and snowy enough outside that many of us are longing for warmer climes. Pineapple always makes me think of the tropics, and there's nothing more celebratory of a Caribbean vacation than a piña colada, so I decided to "Christmas-fy" the flavour of the drink into a crunchy, fruity, dippable cookie. While the cookie itself is flavoured with both pineapple juice and rum, I couldn't leave it at that when it came time to wrap them up for gifting. Instead, I whipped up a glaze with leftover pineapple juice and powdered sugar and double-glazed each cookie, giving them shine and an extra layer of tangy-sweet goodness. Unfortunately I didn't note the amounts of sugar and juice, but I did mix them together before bringing the glaze to a simmer for a few minutes just to activate the cornstarch in the sugar. Double-glazed, these took a good 8 hours to dry enough to wrap, but the ends we saved off to the side didn't have to wait - stickiness and all, they were devoured! 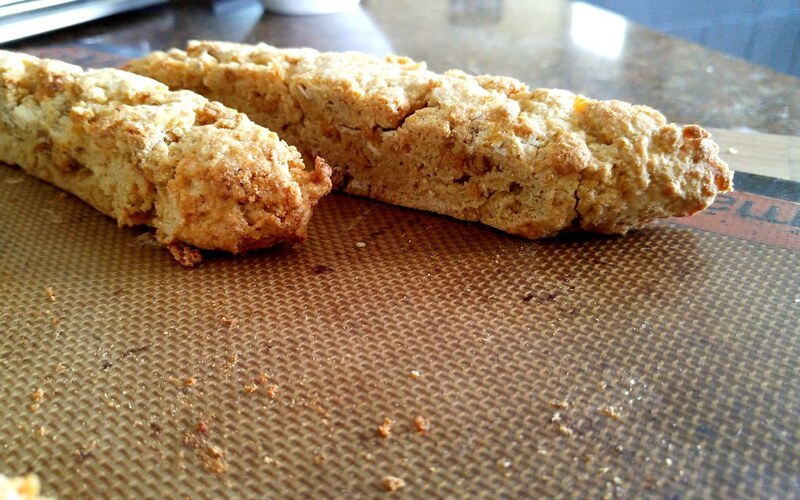 In lieu of nuts, I wound up using a crunchy granola-flake cereal for texture in these biscotti. If money were no issue, 100% it would be macadamias though! 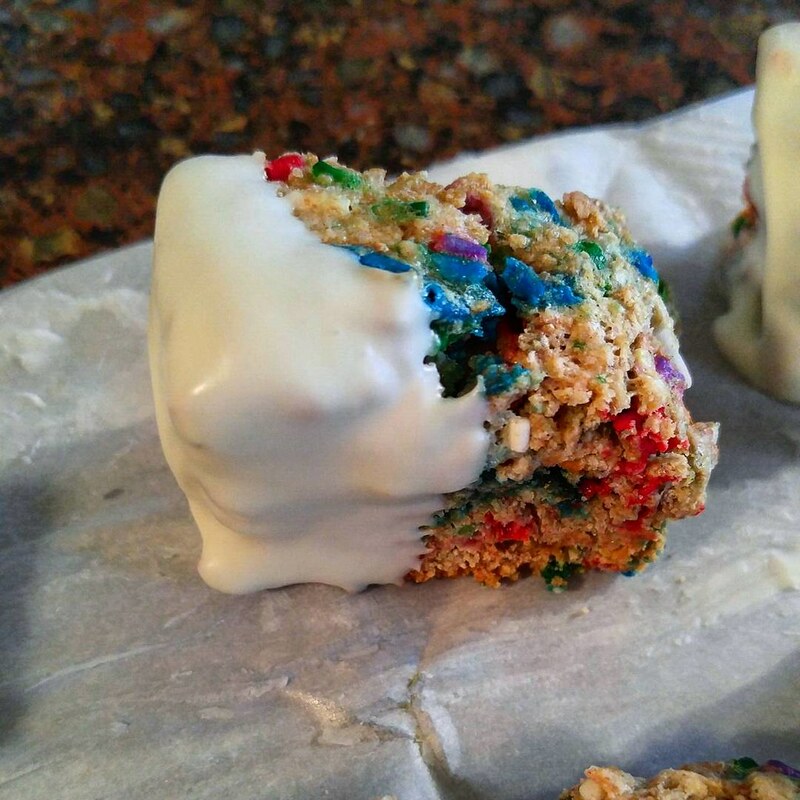 I love using granola for nuts in baking because I always have it on hand, and since I usually (but not always) make my own I can make sure it is nut free for when I teach at school. These are the prettiest chocolate chip cookies I've ever seen, and they taste amazing thanks to a slight earthiness from shredded raw beets. Guess what - they're gluten free and vegan too! I can't believe it took me so long to appreciate the sweet, earthy deliciousness of beets. As a kid, they were "old people food" - served cold, out of the can, in a sticky-sweet sauce I couldn't stand. When I started growing my own - mom loved the taste and I loved the variety - I realized how good they were either raw or slow-roasted. No sugar or butter required, just the smooth flavour of caramelized roots or the bright, sweet crunch of raw shreds. Of course, baking with beets has been something I've done for ages, and since they are inherently sweet they play so well in the dessert arena. Of course, dark chocolate with it's bittersweet tones is a natural pairing for beets, but for the holidays I wanted something that really let the deep magenta colour of the roots shine through. Beantown Baker had a recipe for the cutest pink vegan chocolate chippers that I had stashed away for years, and with the last of this year's beet glut I finally got around to making them! I switched up the all-purpose flour with my Artisanal Gluten Free Flour blend (and found I needed a little more to get a "dough" consistency) but otherwise kept everything the same. 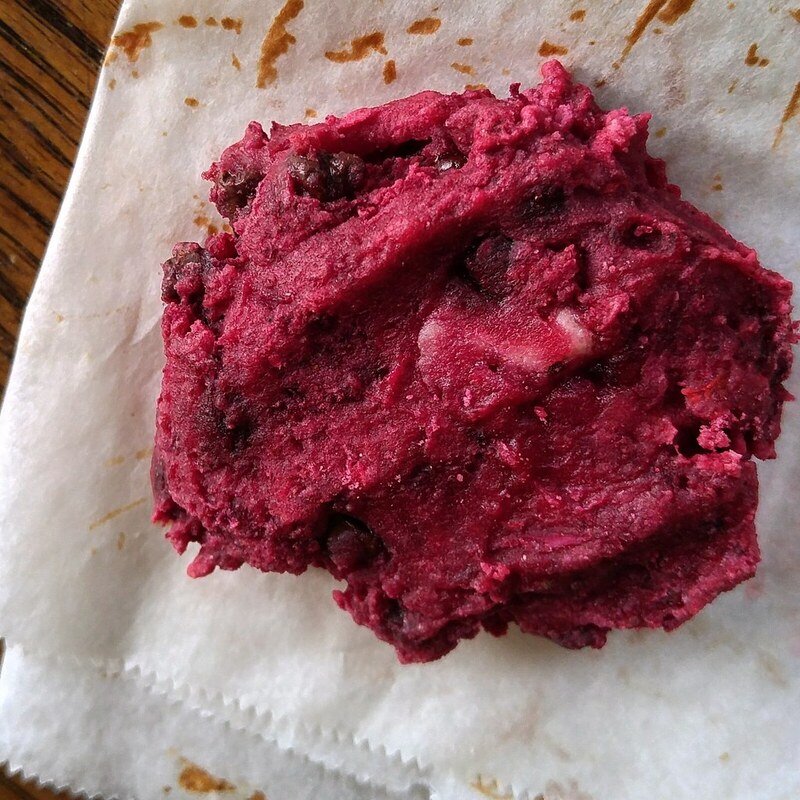 During baking, the house was filled with the lovely sweet, earthy aroma of roasting beets just tinged with melted chocolate and vanilla, and the resulting cookies had a complex, not too sweet flavour that both kids and grownups enjoyed. None of my taste testers could tell it was gluten free, and those who followed that diet were glad to have a special holiday cookie in their gift baskets. Next year I might add in some chocolate chunks as well, because more chocolate is ALWAYS better! 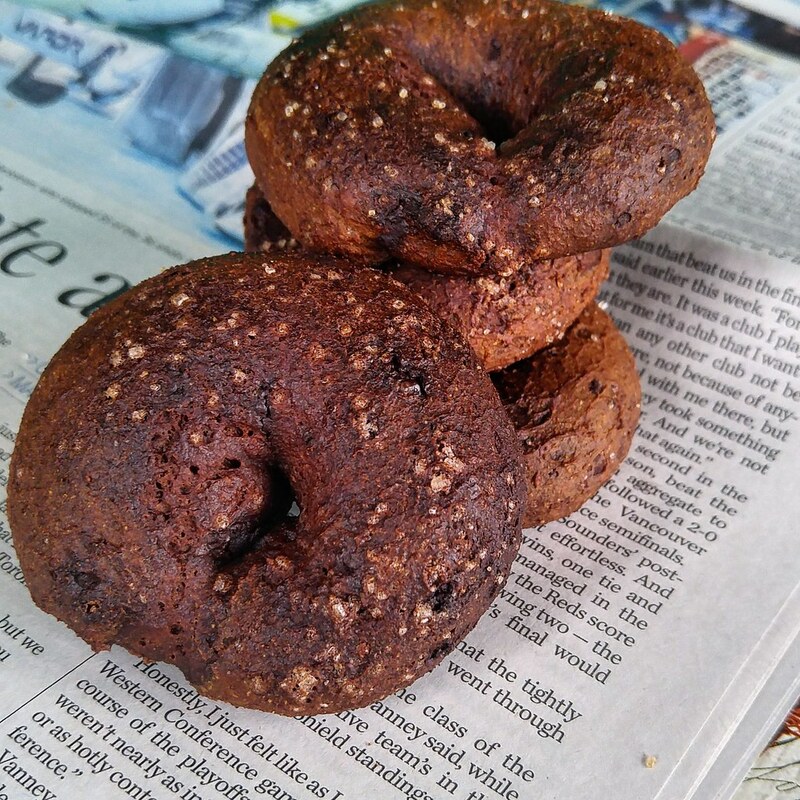 Smooth, creamy cottage cheese is the base for these crisp-chewy, chocolatey ring cookies. A sprinkle of coarse sugar adds crunch. I have a stepfamily with deep roots in Italy. Half of the adults were born in a small town in the Apulia region, and their traditions and culture are dominant (occasionally even oppressively so) in their lives here. No time is this more apparent than the holidays, where almost a whole week is dedicated to celebrations. First, there is my stepdad's "first" birthday (he has two... long story about escaping military service in the old country), where he and my mom go out for the day. Then comes Christmas Eve, the day of the Feast of the Seven Fish which is spent cooking, serving and agonizing over hostessing. While it's supposed to be a holy-based event, like Lent and "fish on Fridays" it's really more in ceremony than in substance, but observed nonetheless. Obviously, Christmas follows in all it's commercial wrappings and further feasting, and finally just around New Years we have stepdad's birthday #2. For each of these events we're guaranteed a minimum of 20 guests at the house, most of whom are proudly Italian by birth or marriage, while my sister and I are content with Rudolph and the Grinch. I know I sound rather cynical about the holiday, and in a sense I am - I'm not a good "people person", especially in groups, and like a lot of other foodies I have little in common with anyone else. I do take solace in the fact that neither my sister nor I eat the "holiday meal", nor do we fit the "expected" mould of "married with kids". The other reason the Christmas holidays are generally not exciting for me is that there is an embargo on my cooking or baking being served at family functions. As a result, I really have nothing to do with the holiday. While I may not be allowed to serve my treats on the actual buffet, nobody will stop me from giving out my cookies, candy and preserves as gifts. I try to pick a few things that have cultural ties for the Italians' baskets, and along with biscotti this year I chose these cheese-based, chocolatey ring cookies. The original recipe utilized ricotta in the dough, but I had none on hand at the time. What I did have, though, was an even creamier, richer tasting product: Nordica Smooth Cottage Cheese. Almost identical to the "extra fine" ricotta that costs $7 a tub, it was far easier to cream into a smooth dough and added the perfect amount of cakeyness to the inside of the baked cookies while their exterior gained a crisp, burnished shell. The ring shape is easy to hold and dunk in coffee, or stack up on a skewer for a fun presentation. Everyone loves cookies at the holidays--no matter what holidays you are celebrating. And there are so many wonderful traditional cookies all over the world that we have decided to revisit this theme. Check out December 2014 for other choices from our first time doing it. And get inspired to get into the kitchen! Italian Ring Cookies from What Smells So Good? Gently spiced, these soft cookies are butterless and perfect for a morning cuppa. That said, it is the holidays and thus the season of overindulgence in everything, so with these cookies I employed cookie strategy #2: smaller cookie size. This way, you can have your two cookies and eat them too, without the guilt of polishing off a batch of shortbreads (wait, am I the only one who does that?). These cookies are also devoid of one of the season's greatest ingredients - butter. Instead, canola oil keeps them soft and moist while keeping it's flavour neutral, allowing the maple, cinnamon and allspice to shine through. The only adornment they need to take it from an "after school special" to "dessert platter worthy" is a dusting of sparkly sanding sugar - I actually used raw sugar for a more "natural" look, but for Christmas parties red and green might be nice too. Rainbow Biscotti Bites are kissed with hazelnut flavour, loaded with sprinkles and dunked in white chocolate for a festive finish. I love making biscotti for the holidays because it is a combination of three things I look for in a cookie: its easy, it's variable, and it can be made well ahead of time without losing quality. 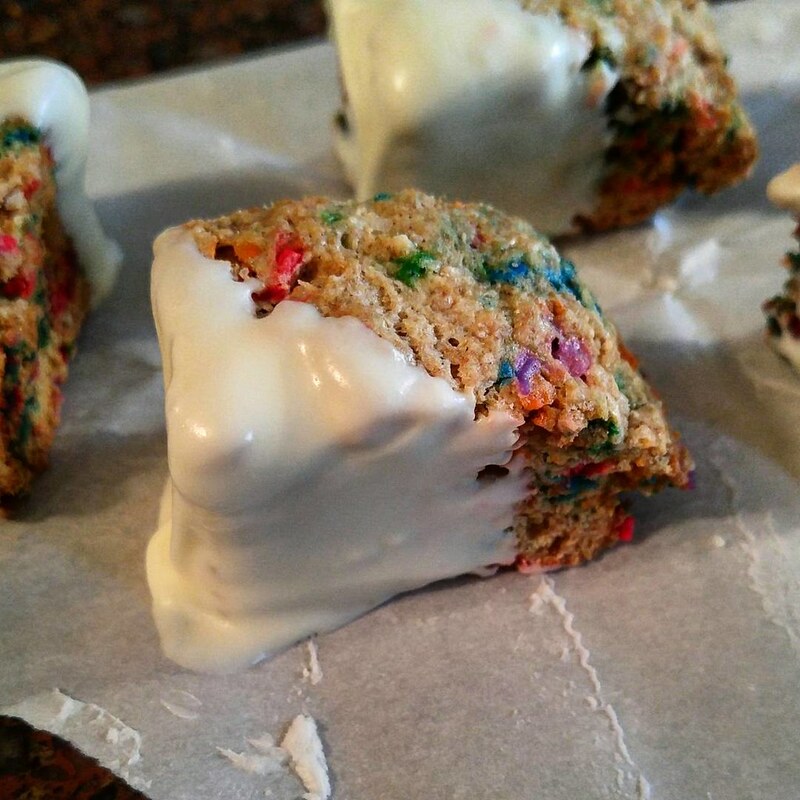 Usually I go for the long, slim fingers of twice baked cookie, but when I found these rainbow cubes of crunchy biscotti dunked in luscious white chocolate on the Food Network site (courtesy of Izy Hossack) I knew they would be a hit in the Christmas gift baskets. The original recipe calls for Amaretto and almond extract. I am personally not a fan of almond flavour (although I do like raw almonds on their own), but the notion of adding nuttiness to the cookies in some way appealed. I had a bottle of Frangelico and some hazelnut extract standing by, as well as naturally nutty tasting spelt flour, and the combination worked admirably! The only thing I will say about these cookies is that they do bake up quite hard and crunchy due to just egg whites in the dough, so they are best dunked - say into a cup of cocoa. 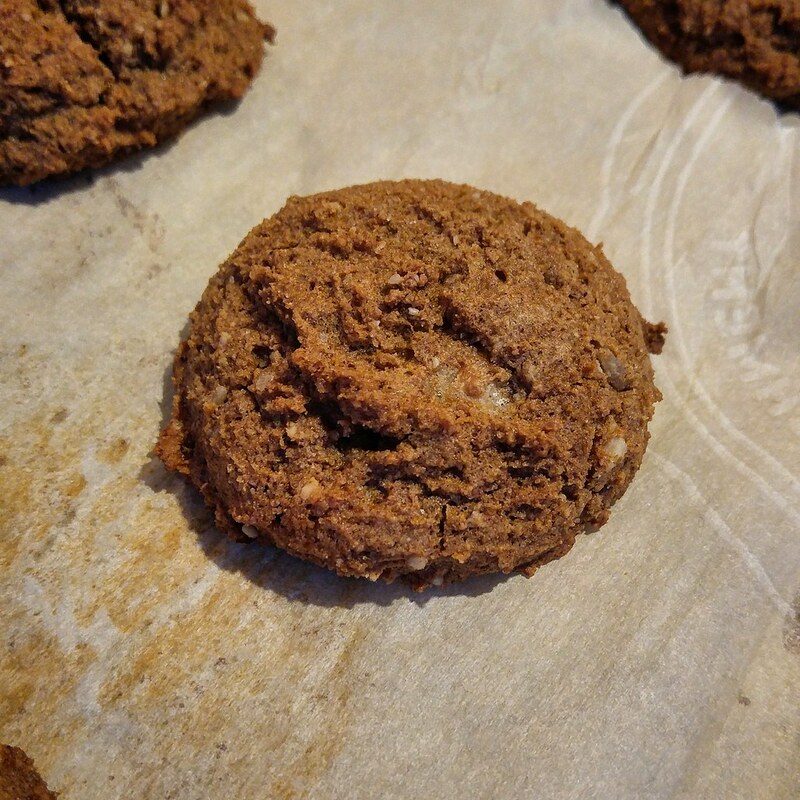 These oatmeal cookies are "a bit better for you" - low fat and full of fruity flavour from homemade fruit butter! While the break rooms in offices everywhere are teeming with sugary goodies this time of year (ours sure is), sometimes it's nice to just have a bit of a break from it all. I'm not talking giving up treats cold-turkey, mind you - it is the season of sugar and spice after all, but why not opt for a sweet, chewy, moreish cookie that doesn't weigh you down even while you're enjoying the indulgence? 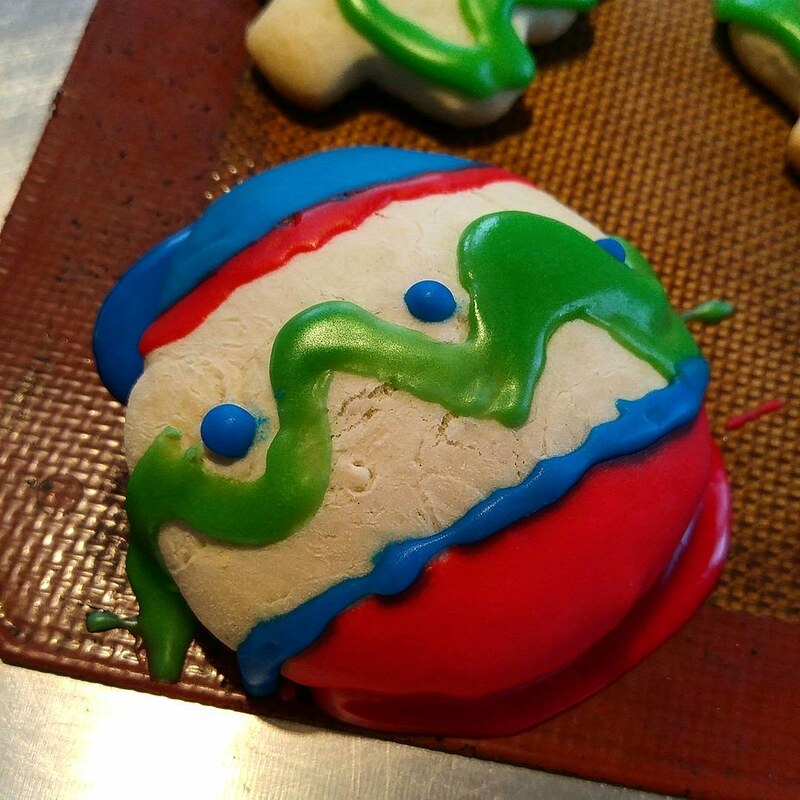 I'll be the first to admit, these cookies are not lookers. 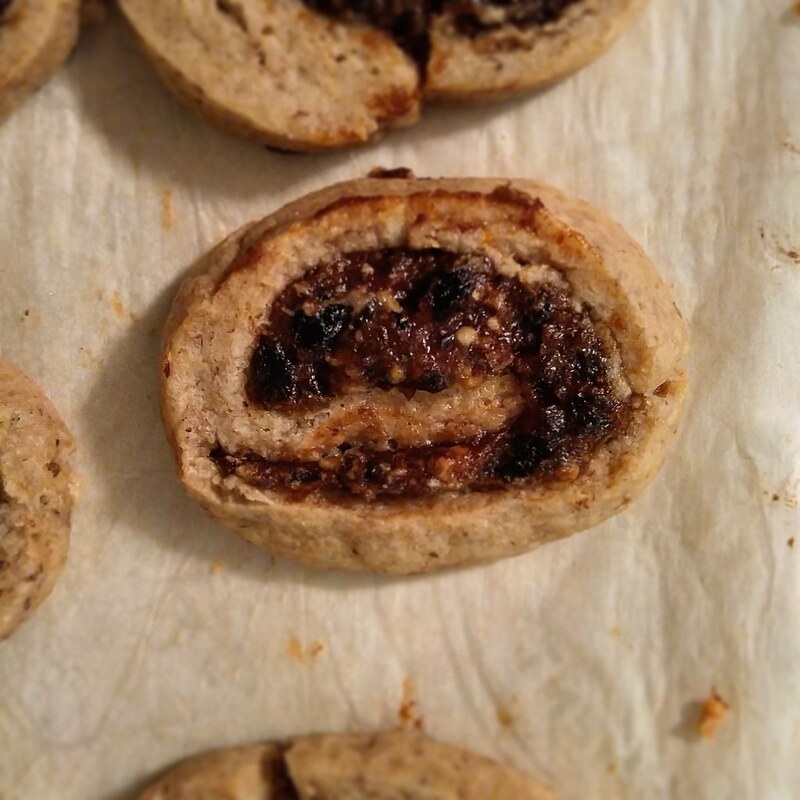 Think of them as the hobbits of the cookie world - a little lumpy, brown and rustic. I promise you though, if you can get past the rather imperfect appearance and have a bite, you'll be rewarded with all the best parts of Christmas baking in a mouthful. Cinnamon and nutmeg are the punchy spices in the batter, while hints of sweetness from the fruit butter and raisins as well as butterscotchy Muscovado sugar and crunchy pumpkin seeds prevent things from getting too hot. Egg free mayonnaise replaces the eggs to keep things vegan, and everything is bound together with oats and half-whole grain flour. It sounds a little strange - and I agree, the description doesn't do the cookie justice. But since the original recipe came from esteemed baker Daphna Rabinovitch, I'm not going to question. I'd rather taste, anyways. One thing I will emphasize about this, and any other oatmeal-containing cookie you may happen to make: resting the batter, even for an hour at room temperature, will make a better, more even textured cookie. It softens the oats just enough so they don't turn into glasslike shards with the heat of the oven, and the cookie stays together better because the starches and proteins in oats have a chance to mingle and bind. Many bakers will say chilling overnight is best, but I've learned through years of teaching Home Ec that 60 minutes works pretty darn well when you have a high-hydration batter like this. Don't worry though - I haven't bailed on the Christmas cookie train completely. Stay tuned - I'm going to try and post as many of the recipes I baked this year as I can before Christmas! 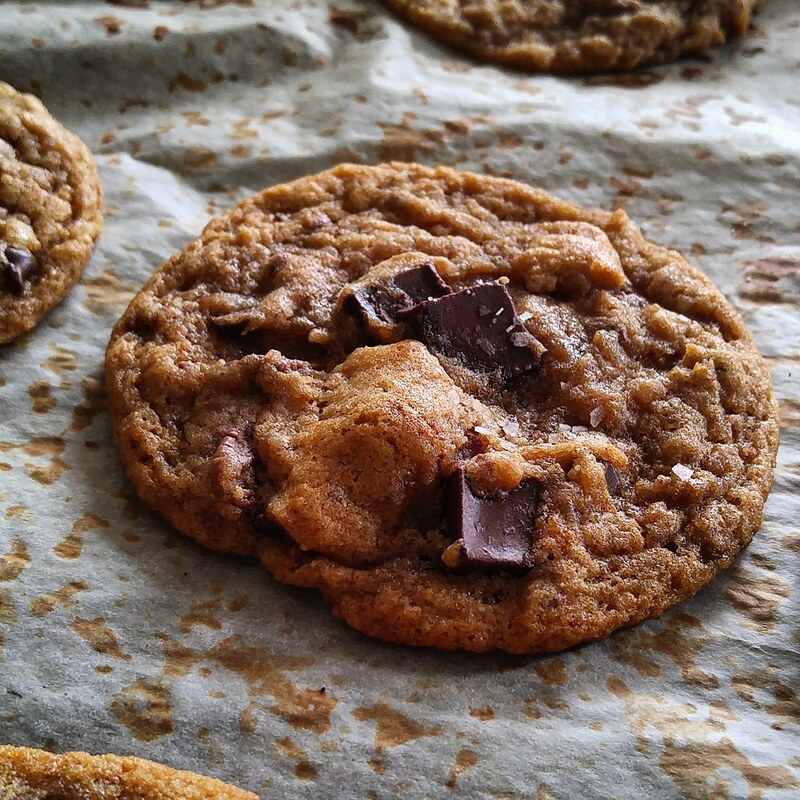 (Almost) Ovenly's Salted Chocolate Chip Cookies are a vegan classic turned up to 11. Chips and chunks of chocolate bring the goods, while kosher salt in the dough and on top push the sweet-savoury limit. Most people would say they can't think of anyone who would turn down a chocolate chip cookie. It's true - the basic formula of butter, brown sugar an a heft dose of chocolate is enough to whet the appetite, even more so when the batter is ever so slightly on the salty side. I, on the other hand, seem to be surrounded by anti-chocolate chippers these days, and what's more surprising to me is that a portion of them are kids! Well, I can't change the minds and palates of those who refuse to embrace the chewy, moist perfection that is a perfect chocolate chip cookie, but I can make a batch that tastes and feels just as good as the melted butter / egg yolk version I love while being completely vegan and low in saturated fat. While kids don't necessarily care about the sugar, flour and fat in a cookie (and really, it's a cookie), adults can have a more refined palate for things like that. Using Ovenly's recipe as a jumping-off point, I used spelt flour and bittersweet chocolate along with crunchy salt flakes, each layer adding to the sophistication of the cookies. You'll notice a few chilling times in the method too - these are not the wham-bam-thank you ma'am cookies from the back of the chocolate chips bag, but (to quote Alton Brown) your patience will be rewarded. Not only does the rest time allow the whole grain flour to hydrate, but the more solid dough prevents chocolate sinkage when it comes to bake time and the brown sugar lends a deep caramel note to the whole batch. The brief freeze immediately pre-baking is also paramount for the cookie's final shape - baking the dough from room temperature would cause way too much spread on the tray, since even cold they flatten a good bit. Now as for the taste, it is definitely a connoiseur's cookie. Does it taste like the butter and egg laden ones, or the giant bakery creations, or even the classic Toll House recipe? Well, no. But they are delicious nonetheless, chewy and with that bittersweet / salty contrast that makes chocolate chip cookies just so addictive. Everyone who likes a chocolate chip cookie will like these, but those with a penchant for dark chocolate will love them. As a bonus, without the eggs and dairy to contend with it's relatively safe to put them out on a holiday dessert table, even if you left the label at home. You can even taste test the batter... you know, for quality control. Time for a break? 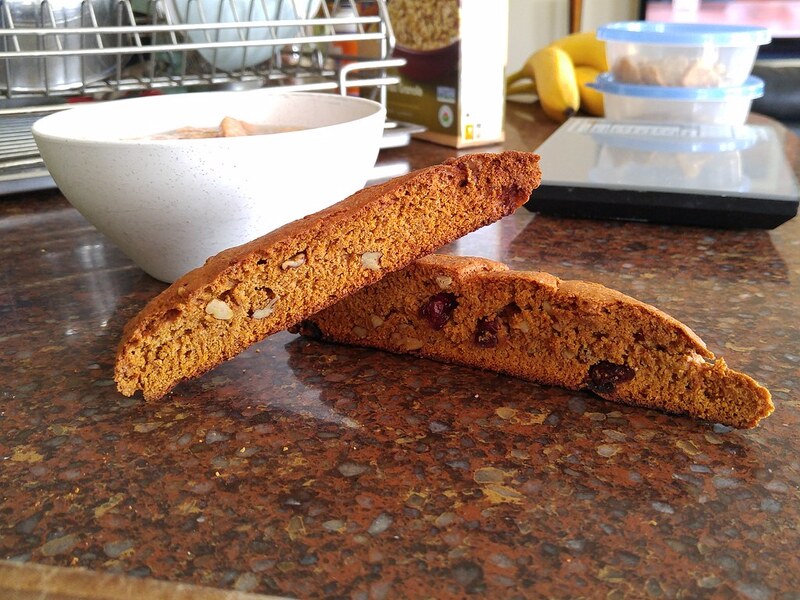 These gluten free, vegan gingerbread biscotti are crunchy, spicy and perfect with a cuppa. 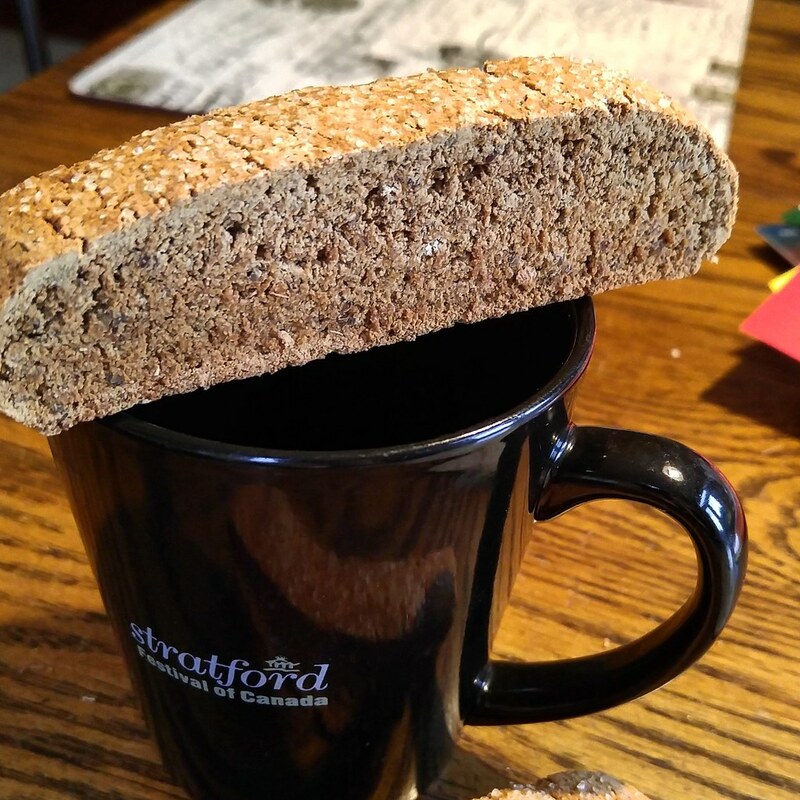 It's officially biscotti season once again! Granted, I've never restricted my biscotti baking to the winter holidays, but it seems more socially acceptable now. Biscotti is one of the easiest (to me) recipes to customize, since there's no risk of the cookie being too dry if you bake it a bit longer, and in general a stiff dough holds together and doesn't spread as much as a batter cookie if you take away something like gluten or eggs. For gift giving, I regularly make eggless and nut-free biscotti because a) they go to mixed company who may have allergies I don't know and b) I never buy eggs. 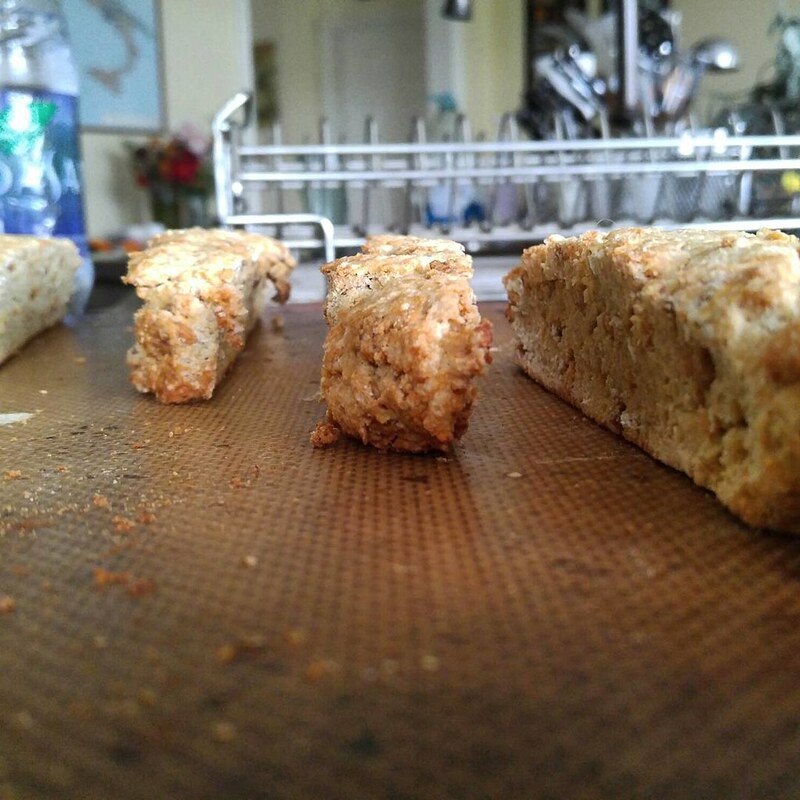 For one recipient, I had to not only veganize but de-gluten and un-soy a biscotti recipe. I had pegged Susan's recipe a long time ago and since it was already vegan, it seemed like a good candidate. She had noted some issues with making the recipe gluten, fat and animal free, but when I saw she had used Bob’s Red Mill gluten-free baking mix as her flour I was willing to give it a go with my own flour blend instead. As much as I adore Bob's Red Mill, and I do, that product in particular is just not good. However, with my Artisanal Gluten Free Flour (adapted from Kelli and Pete Bronski), I had zero issues at all. For flavour and tenderness (and to neutralize any possible grittiness) I added pineapple juice and allowed the dough to rest 15 minutes before shaping. The first bake looked perfect - golden, with a hint of crunchy sugar on top, and when I went to slice it it went cleanly (unlike some of my more "traditional" biscotti). A second bake and cool down later and I had crisp, spicy cookies that held together in a cup of coffee but didn't break your teeth. This will definitely be a repeat performer! Date-Nut Pinwheel Cookies are infused head to toe with white wine and the decadent flavours of Baklava. There is something about pinwheel cookies that just screams "holiday". When else but the months leading up to Christmas can you find such a dedicated array of swirled treats? From simple two-tone sugar cookies to delicacies filled with caramel and almond, sweet cinnamon or even peanuts and Nutella, there is something for everyone. Of course, being a lover of date squares, fig newtons and baklava myself, I didn't even think of hesitating when I came across a recipe in the LCBO magazine that had a rich, wine soaked date puree mixed with walnuts, honey and rosewater as a filling. 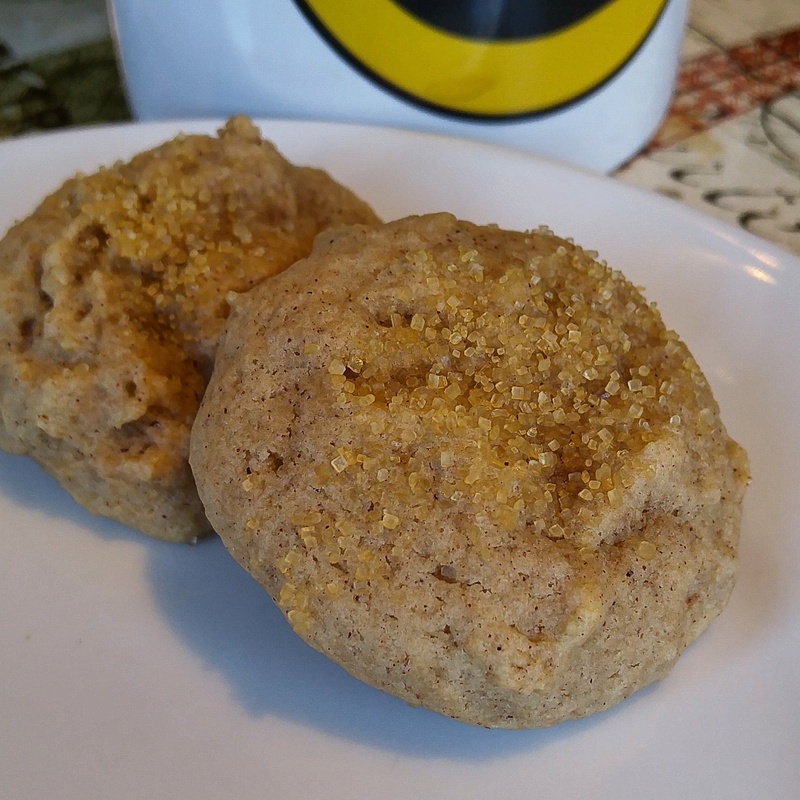 The cookie itself is a relatively basic brown sugar dough, made with half butter half shortening in order to allow a little more plasticity during rolling. Like most pinwheels, these swirls are perfectly at home in the freezer, especially when stored in paper towel rolls (which maintain the round shape). I made a batch a few months ago, froze it, and now am at liberty to bake just what I need for a cookie tray. In fact, while the recipe doesn't explicitly say it, if you have time freeze the filled roll for at least 30 minutes before slicing it so that it stays mostly round. If you cant wait... well, dental floss works better than a knife at that point. BTW - You will have leftover filling. It's a fact of life. But a very tasty, very versatile fact of life. Smear it on hearty crispbread with some sharp cheese or even top a schmear on a bagel... you'll be glad you did. 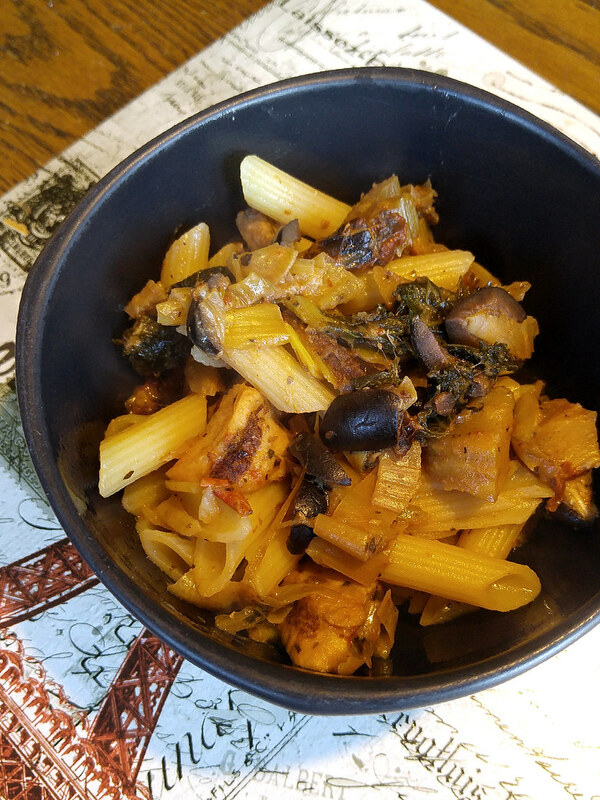 Mediterranean Chicken Pasta with @prosticks2go skewers, olives, leeks, artichokes, homegrown kale, homemade tomato sauce and homemade ricotta! 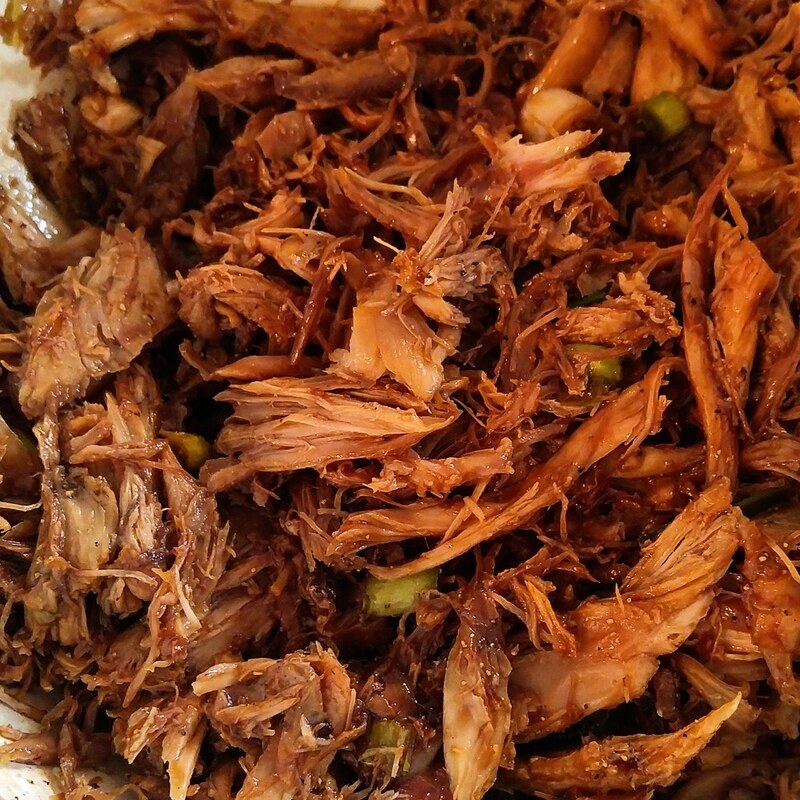 In this lull between Thanksgiving and Christmas feasting, we've run out of the luxury that is leftovers. My family, in general, actually looks forward to this break because we know that all too soon we'll be spending a full week in the kitchen preparing for three full days of company and eating at the end of December followed by a month of leftovers (I'm not in charge of purchasing, but those who are chronically overbuy). At any rate, it's starting to get blustery outside too, which demands meals that are hearty, comforting, flavourful and nutritious. Knowing that full one-dish meals are prepped and ready to heat in the fridge means less chance of pizza or Chinese take out after a day of shopping or grabbing fast food out at the mall. Of course, just because something is homemade doesn't mean it can't utilize a few shortcuts. 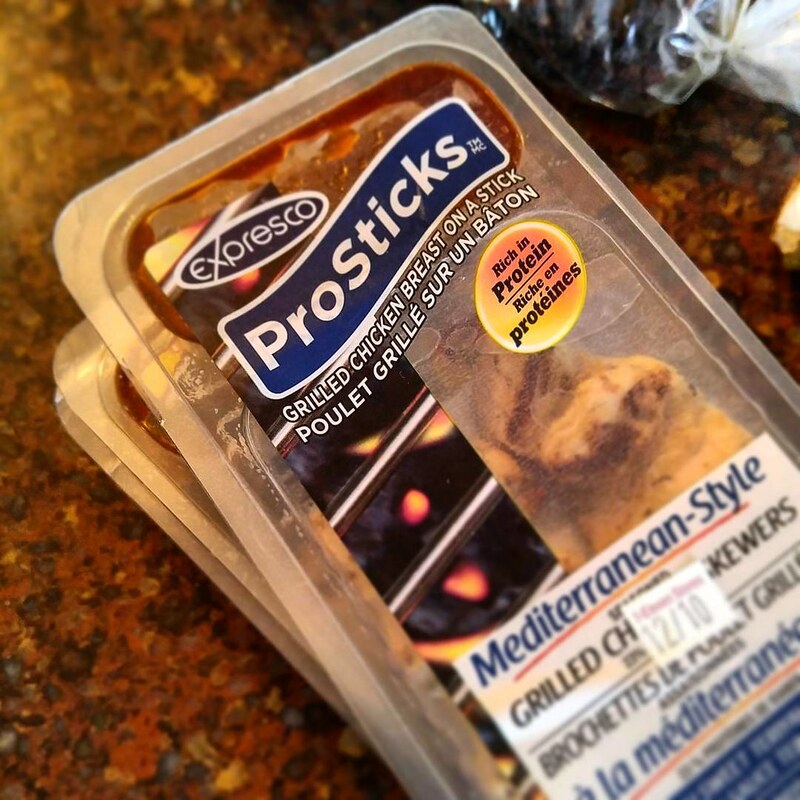 I was approached by Expresco a few weeks ago and asked if I could review a new, health-conscious, on-the-go snack food of theirs called ProSticks. ProSticks are an ideal protein-laden nibble for people out and about who only have access to a convenience store for a quick bite. Three flavours of marinated chicken breast on skewers are available (chipotle, sriracha and Mediterranean), and each package comes with a packet of dipping sauce. 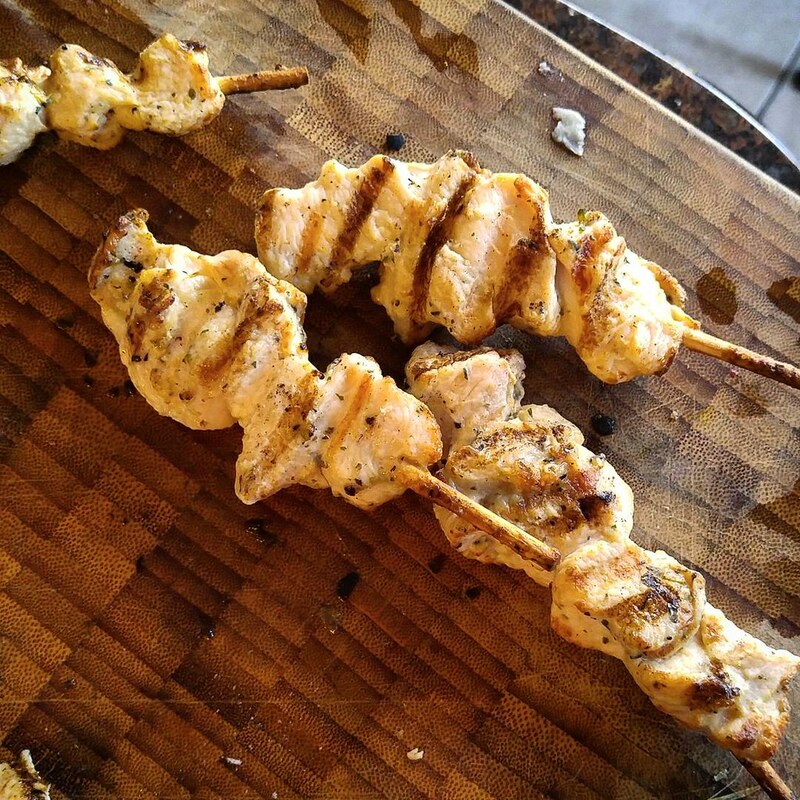 I was a bit confused as to the pairing of teriyaki sauce with the souvlaki-tasting Mediterranean chicken, and upon tasting the dipper I discarded it - it was simply too sweet and did not work well with the more herbaceous protein. The chicken, on the other hand, tasted like cold souvlaki. It was tender and moist, although the meat clung to the skewer so tightly I had to resort to a knife to disengage it. I was also a little thrown off by the shape of the meat on the skewers - the company promotes the snack as being made with "whole muscle" meat, but I've never seen chicken breast this irregular. I've also never been able to get such clear grill marks on skewered chicken, but I'll give the company the benefit of the doubt and communicate to you what they promise - minimal processing. 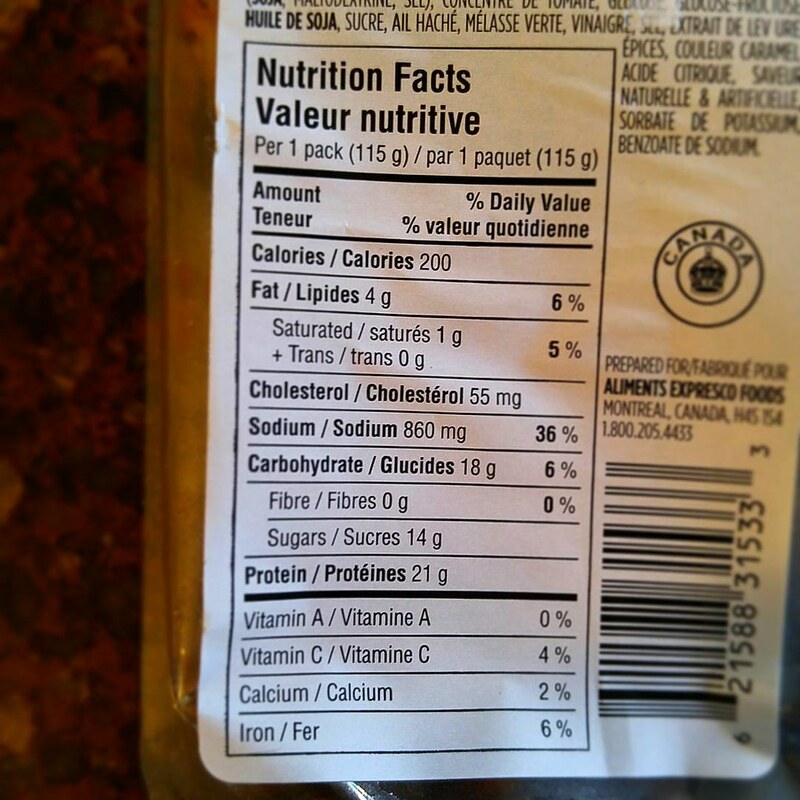 Here are photos of the back of the package, depicting the ingredients and nutritional information of a packet of Mediterranean ProSticks. Bear in mind that the NI applies to the whole package of meat and sauce - I'm willing to bet the majority of the salt and sugar listed is in that teriyaki dip. However, if you enjoy sweet sauces, bear in mind that 200 calories for a relatively small snack is quite a lot - it is best as a supplement to a light meal such as a salad or soup. 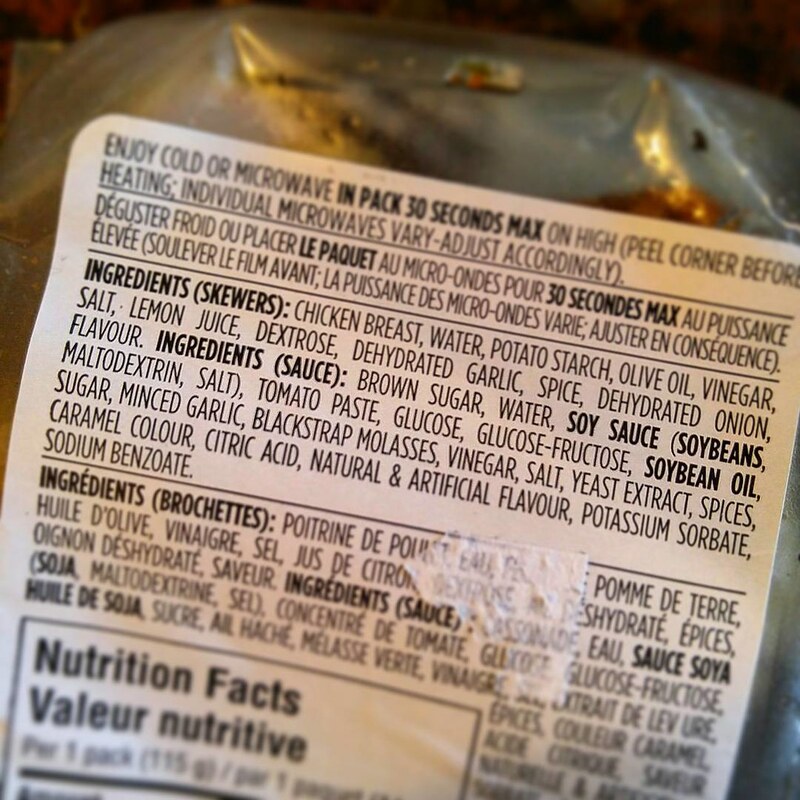 There is no indication of any top allergens in the ingredients (except soy in the sauce), but I confirmed with the company that they cannot declare these "gluten free" as their facility processes gluten-containing items. In addition, if you're planning on eating these on the road, you'll want to pack a pair of scissors or a sharp knife to open the plastic. There is a "convenient" tab in the corner marked "open here", but try as I might pulling that corner did nothing to unsnap the box. The plastic is rigid - great for protecting the meat inside (does it need protection?) but frustratingly sharp to get past, and inversely the compartment for the sauce is made of flimsy, crushable plastic perfect for squirting sticky liquid over your backpack. I would suggest the company reverse the two packaging constructs. Obviously these skewers are meant to be eaten on-the-go, as is, but I couldn't help but see how versatile they could be too. With the herby, souvlaki-esque Mediterranean variety as my inspiration I set about making a pasta dish echoing similar flavours: artichokes, black olives, leeks and kale along with a jar of homemade Homegrown Tomato Sauce from last year and a cup of homemade ricotta. A bowl of this is hearty, stick to your ribs and full of nutrition. If you can't access ProSticks (currently they're in 7/11 stores in Ontario as well as some Sobeys) roasted chicken breast (or leftover souvlaki) works too. Baked Bao are stuffed with a hoisin-soaked turkey mixture and baked to golden perfection. Hot or cold, they're a treat for lunch or an after school snack! I hope everyone who celebrated Thanksgiving yesterday had a wonderful and thankfulness-filled holiday! For my part, I spent the whole morning writing my last final (yay for no more exams!) and by the time I got home I was glad cooking an elaborate meal was not a necessity. However, I still had to cook, because we had finished all our Thanksgiving leftovers ages ago. Tough life, eh? One of my favourite things to do with leftovers is to not simply re-purpose them, but transform them into another dish entirely. While grocery shopping, my mom and I were discussing some of the things she was exposed to while working overseas and in an office marked by a diverse mixture of cultures. One thing she mentioned having a few times (and missing in retirement) was Chinese dumplings. For one of her co-workers birthdays, the gang went to a dim sum-leaning restaurant serving a variety of these filled dough pockets: boiled, steamed, fried and baked. 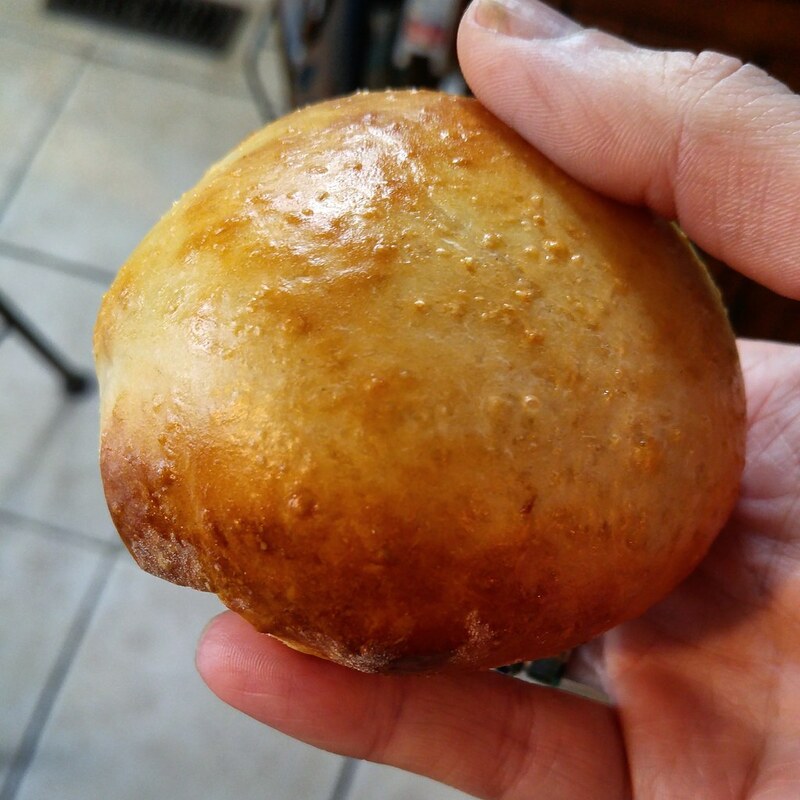 Knowing we had leftover turkey in the freezer and a glut of hoisin sauce (left over from a stir fry or two) in the fridge, I decided to give a baked version of the BBQ meat buns a shot. The recipe is ridiculously simple to prepare, although the ingredients may require a trip to your local Oriental market (we cook a lot of Asian-esque food at home, so these were all pantry items for us). It is also a fantastic multi-day friendly preparation, which I wound up doing since school and work had to be attended to. The filling was mixed, covered and chilled overnight, and in the time it took to come back to room temperature the next day the wrapper dough was made, risen and ready to go. The most intensive part of making this Thanksgiving revamp was the filling and sealing of the buns, which was made 100% easier with a disher / cookie scoop. As a bonus, the oil-rich dough moisturizes your hands like crazy and smells mighty fine to boot! What's your favourite holiday leftover recipe? Do you stick to the classic turkey and gravy sandwich or do you completely rehash the meal? Suet sounds awful and archaic, but it makes super-flaky, melt in your mouth pastry perfect for any type of pie! As someone who doesn't eat meat (except seafood and fish), it's surprising to most people (including myself) that I'm no stranger to cooking with animal fat. I take great pride in rendering my own tallow and schmaltz from mostly local animals after the meat is used for dinner. The fat makes some amazing savoury dishes to be sure, but also lends that "old fashioned" flavour to the sweet kitchen. I don't normally go out of my way to purchase these fats pre-rendered, but when I was given a bag of suet from someone who didn't realize it was animal fat (I know...) I started searching up ways to use it. I found a lot of traditional Christmas puddings - which nobody here likes - but I started thinking pastry. After all, suet is essentially the beef form of lard - and the shredded, frozen kind I had in my possession was also covered in flour so the pieces remained distinct. Distinct fat particles = flaky pastry. Lightbulb flash. 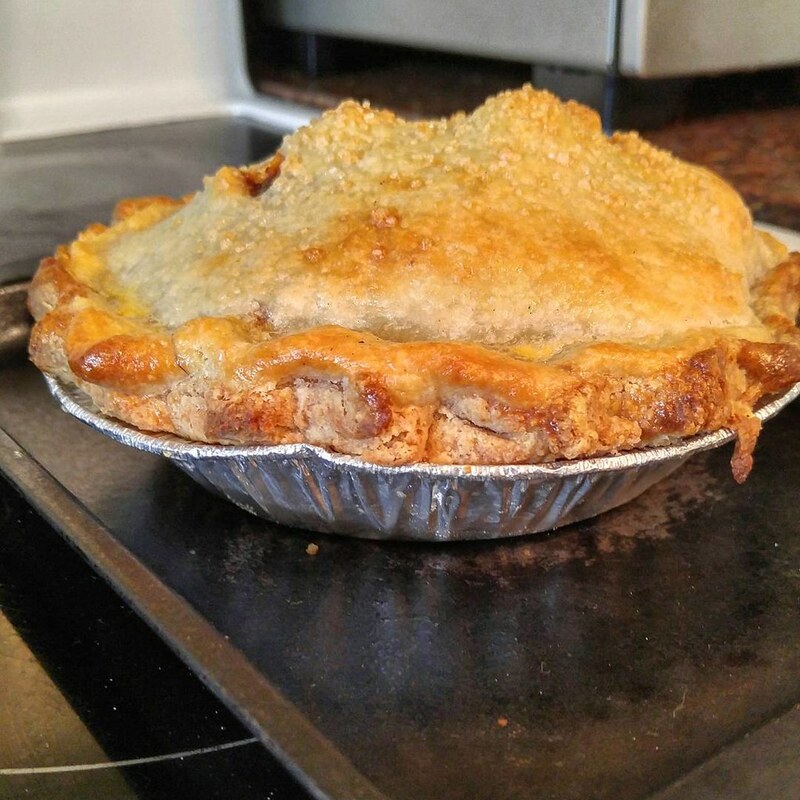 Having used lard before in pie crusts (and loving the tender, flaky result), it wasn't a far leap to make. However, I didn't have any recipes using suet per se, and certainly none using it in this fine, flour-coated format. Thankfully, the UK and Australia seem to utilize this ingredient more than we do in Canada, and I finally found a recipe that promised a puffy, flaky and tender crust. Originally, the recipe was intended for savoury pot pies, and I can see why, as the dough is somewhat more elastic than straight butter dough and if rolled decently thick it would make a suitable barrier against gravy. However, this elasticity worried me a bit - pastry is not supposed to act like bread dough, it's supposed to be delicate and finicky, right? Well I discovered that in this case, a touch of elasticity in the dough did not hamper the tenderness or flakiness of the baked product at all, and made rolling out bases and top crusts so much easier. If animal products are on your dietary "do" list, I strongly suggest trying suet for custard or berry pies with a lot of liquid. For me, the best part was actually price. While I got my bag of suet (enough for three single crust pies) for free, I found it at my local grocery for $1. After Thanksgiving, they were marked down to 69 cents. If you bake a lot of pies during the holidays, stocking up on this stuff makes sense - keep it in the freezer up to 6 months no problem! Maple walnut fans will love these two biters! While I've known for ages that the US celebrates Thanksgiving later than we Canadians do, it flabbergasts me that there is so much hoopla surrounding it. For a holiday so close to Christmas, there is so much ceremony - even more so than us a month earlier! Regardless, Thanksgiving - whenever it is - is a time for celebrating the bonds of family and friends. Whether you do this by cooking a giant meal for 40 or going to a movie and forgoing the whole turkey deal, it's an important occasion that frankly I wish happened more often in our society. Since the next holiday we're gearing up for here is Christmas, I have batches and batches of cookie dough in the freezer at the ready. When we do Christmas Eve for the Italian family, we never have a formal dessert like pie or cake. Instead, there are lots of little nibbles laid out on the table: chocolates, brownies and of course a range of cookies! Last year I debuted these maple-kissed, nutty cookies and they were such a hit I wound up making them again this year for gift baskets. 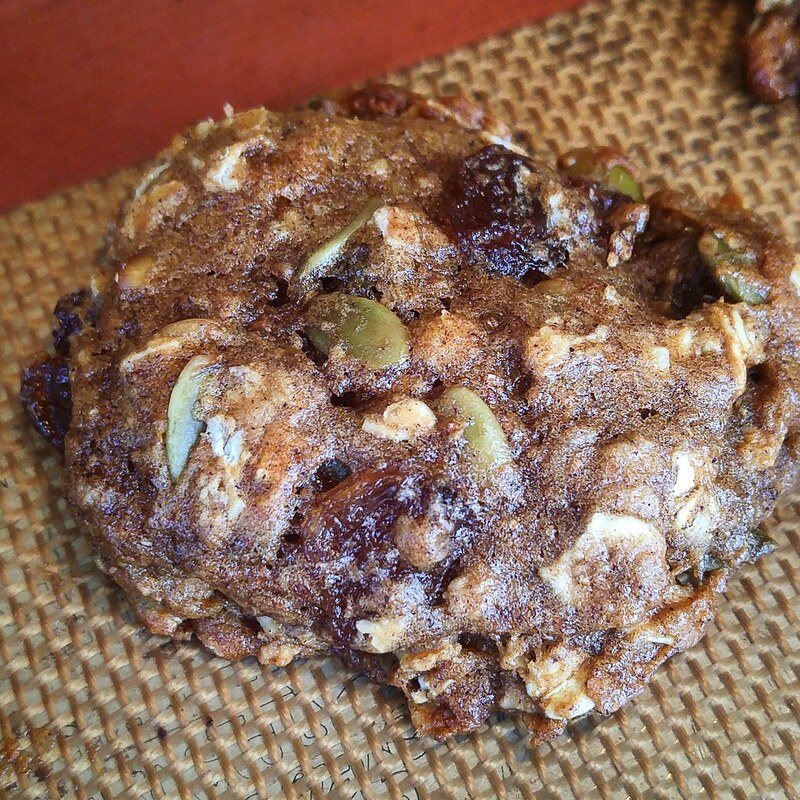 If you love maple-walnut anything, you'll love these! Not only do they get the toasty flavour from walnuts, but they are made with barley flour for a light, almost malt-y sweetness. Maple is in two forms too - real-deal syrup and extract - although this year I tripled the flavour with a sprinkle of maple flakes on top! Ironically, I'm not generally a walnut fan, but in these cookies the sweetness of the maple cuts any bitterness from the nuts and the combination winds up at the perfect level of sweetness. As a bonus, these are glorious freezers both in dough and baked form, so there are always cookies at hand! Need a last minute dessert for a party or a date night? Sandwich a mini-scoop of ice cream (like maple or French vanilla) between two baked, still-frozen cookies and dig in. Small size, big impact. This month for #CreativeCookieExchange, it's all about holiday dessert table cookies that are quicker and easier than schlepping a pie. If you are in charge of bringing dessert this year, be sure to check everyone's offerings out! It’s cookie season! And I know everyone is thinking pies for Thanksgiving, but sometimes time gets away from us and we need something faster. Or maybe you just want something different, like a cookie tray for Turkey Day. 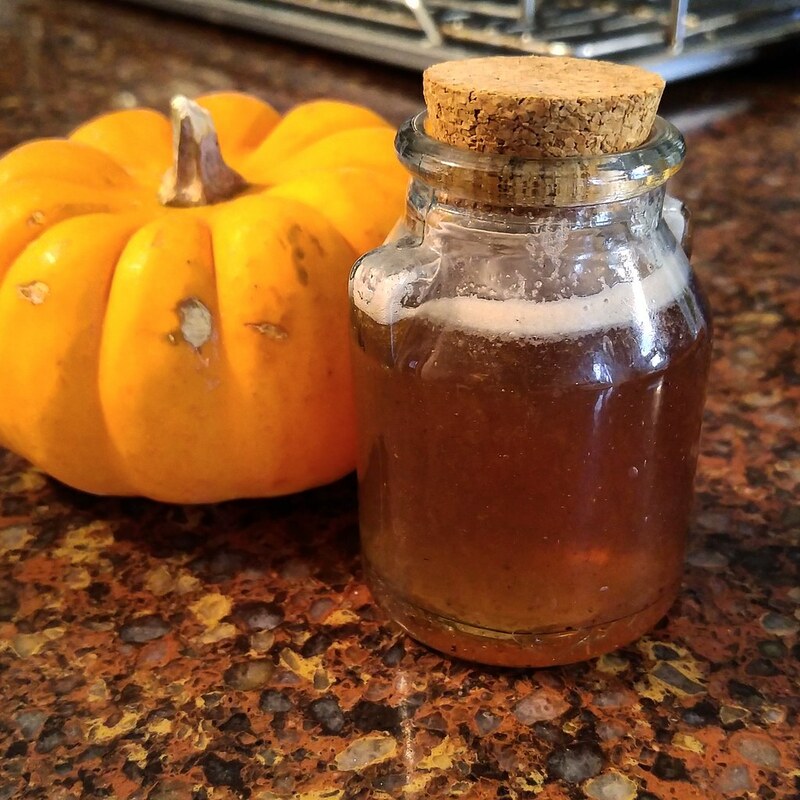 If you're a Pumpkin Spice Latte addict, why not make your own decadent syrup infused with REAL pumpkin, cinnamon sticks, allspice berries and whole cloves along with ground ginger and nutmeg? For gingerbread fans, try brown and white sugars simmered with fresh ginger and a cinnamon stick. From coffee to waffles this is all the best of fall in a jar! Well, 'tis the season for all things sweet and spicy. Everything in the stores these days seems to have an Autumnal equivalent, be it apple-cinnamon, gingerbread or even the often-mocked pumpkin spice. I have nothing against those flavours this time of year - they warm you up from the inside and are almost always associated with physically warm things (like the aforementioned latte). Where I do find it a little frustrating is that "pumpkin" or "gingerbread" items rarely contain pumpkin or real ginger - those perishables are left out in favour of sugar and flavouring. The obvious solution is to make your own! Take this Pumpkin Spice Syrup for example. More than simply tossing cinnamon, nutmeg, ginger and cloves into a simple syrup, I decided to up the "pumpkin" quotient by using a pumpkin "stock" of sorts. It added a lightly sweet, vegetal flavour that perfectly highlighted to stronger spices. In addition, with the exception of the nutmeg I used whole spices as a type of "tea", straining them after the mixture reduced. The result was a flavourful but not overwhelmingly spicy syrup, which is perfect for adding to coffee or cocoa as well as drizzling onto waffles. Combine the pumpkin pulp and enough water to cover it in a large pot. Cover and simmer for 3 hours. Remove from heat and strain through fine mesh. Discard solids. Measure 3 cups of the liquid and return to the pot. Reduce heat to a brisk simmer and cook until reduced by 1/3, about 1 hour. Store in the fridge or can 10 minutes in a waterbath. This dark gingerbread-flavoured syrup is not shy in the spice department, but it is thinner than the Pumpkin Spice version. I canned some for later (leaving the ginger chunks and cinnamon stick in the liquid) and stashed the rest in the fridge, where it thickened slightly, like maple syrup. Again, this is fantastic in coffee drinks (or Chai tea), but wouldn't be remiss drizzed onto pumpkin bread or mixed into cream cheese as a cookie filling. Combine the sugars, water, sliced ginger and cinnamon stick in a large stainless steel saucepan. Bring to a boil over medium high heat, stirring. Simmer 5 minutes. Remove cinnamon stick if desired (I didn't). Nothing makes a home smell beautiful like freshly brewed coffee does. The scent of coffee can help sell houses, it is comforting, and warms the soul in a cold Canadian winter. This recipe is a great twist on the classic cinnamon roll and is a perfect accompaniment to your cup of espresso. It’s a great, sweet pick-me-up, delicious and packed full of flavor. These rolls are a great recipe for a picnic as you can make them in advance for the next day. You can make the dough for your cinnamon rolls by hand, or in the bread machine on a dough cycle. Just make sure that you follow the instructions for your bread machine when putting in the liquids. ¼ cup warm espresso coffee - Investing in a drip coffee maker can help you get really good quality coffee to put in your dough. It is important that you don’t add your coffee in whilst it is really hot, but warm coffee will help start the rising process and activate the yeast. Combine the ingredients in a bowl, mixing to form a dough. Knead until smooth an elastic. If you are making this by hand, then you may need to add a little extra flour whilst kneading. When you have made your dough, leave it in a bowl and cover with saran wrap. Leave the bowl in a warm, dry place for 2 hours or until it has doubled in size. 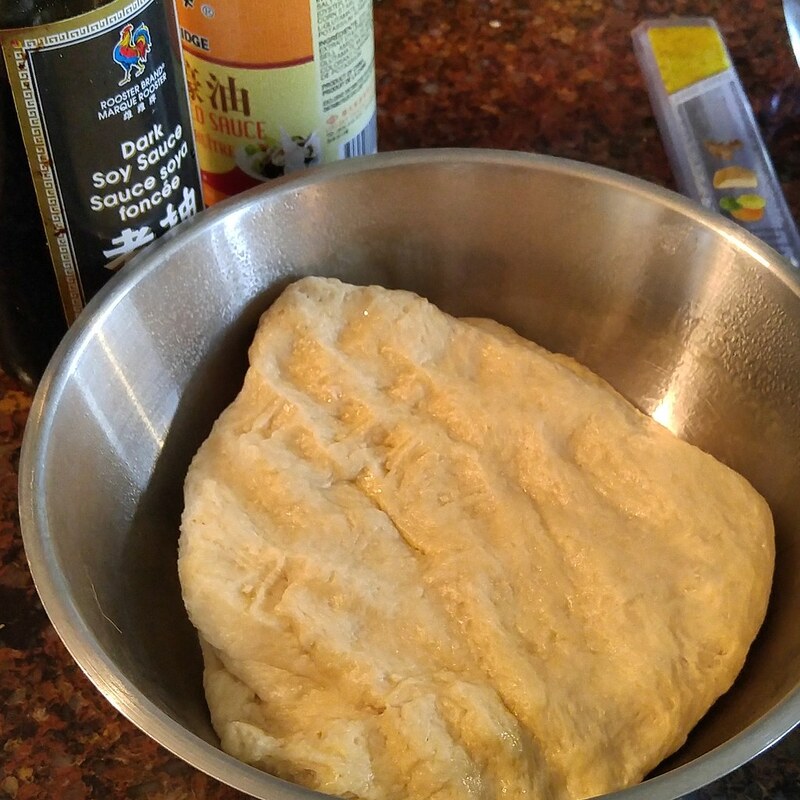 Once the dough has doubled in size, put it on a clean, floured work surface and roll it gently into rectangle, approximately 16x24. Mix together the cinnamon and brown sugar in a bowl. Spread the softened butter all over your dough, then sprinkle over the cinnamon/brown sugar mixture. 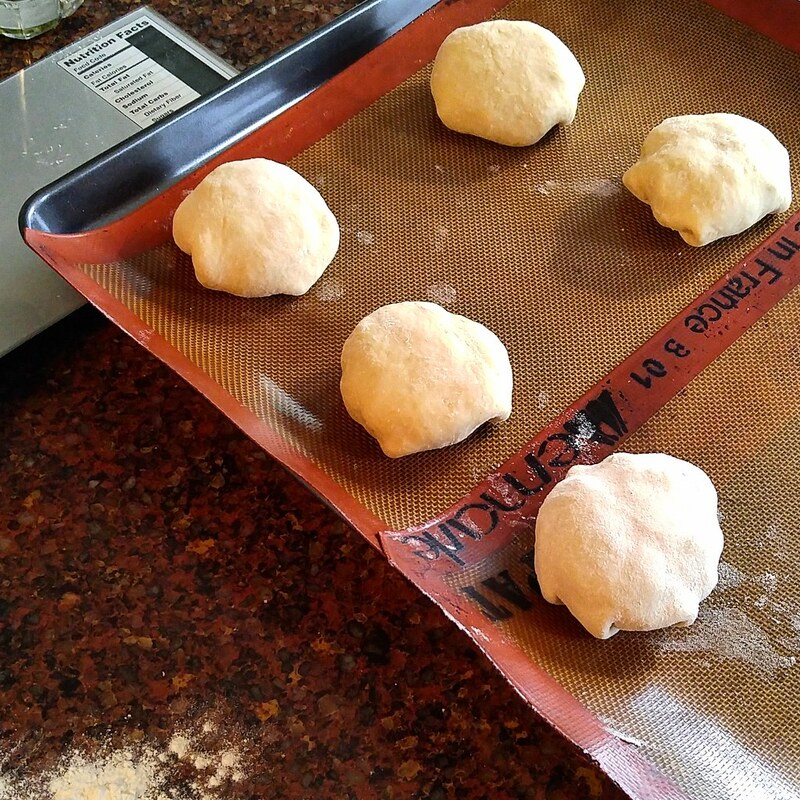 Roll the dough up lengthwise and cut into 12 equal pieces. Put these into a greased 13x9 pan, cover leave to rise for a further hour. Bake for about 15 minutes, until the tops of the rolls are nice and brown. Put them onto a cooling rack. You may wish to leave the rolls plain, but for a great glaze simply combine 3 cups of confectioners (powdered) sugar with ⅓ cup of freshly brewed coffee and spread nice and thick over the rolls. This has been a guest post by a company who wishes to remain anonymous, brought to you by What Smells So Good? 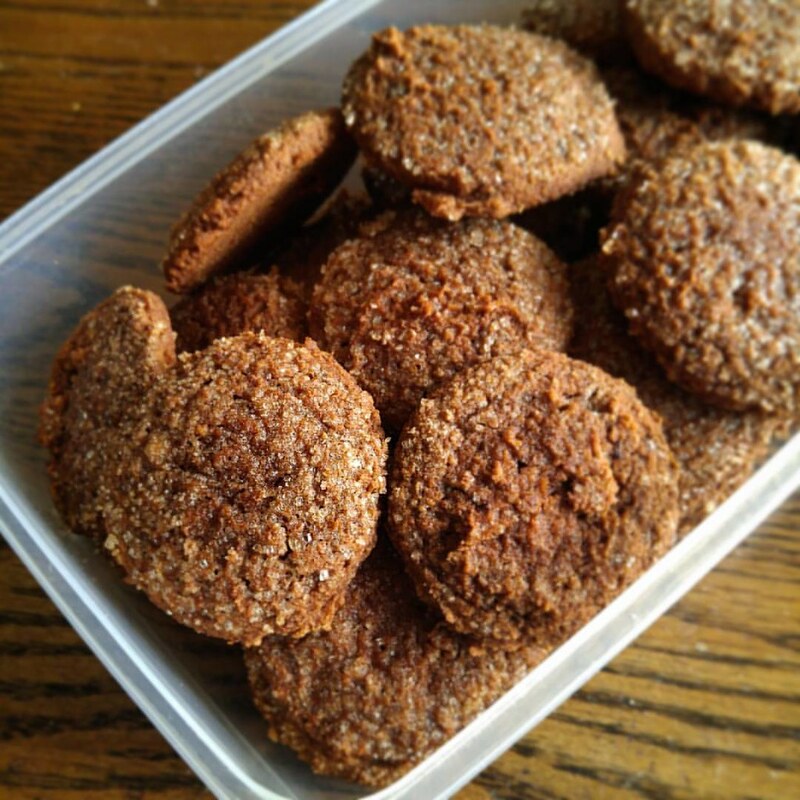 These spicy, soft and chewy cookies are crowned with raw sugar and are perfect for the lunchbox - you certainly can't tell there's anything healthy about them! 'Tis the season for all things baked and spicy! 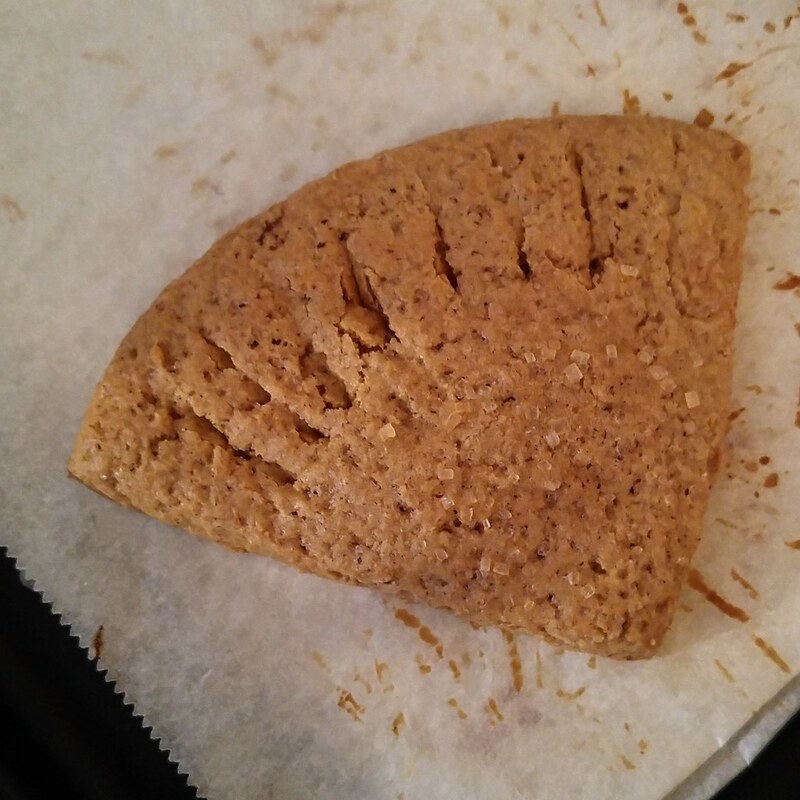 Since I'm always on the lookout for unique, healthy and overall delicious cookie recipes to fill my gift baskets in December, I was excited to try remaking an old bean-based cookie of mine for the festive season. I have a handful of gingerbread fanatics on my gifting list, so in addition to Chestnut Gingerbread Cookies, gingerbread syrup and biscotti I'm adding these soft, chewy and ever so slightly cakey drop cookies to the mix. These are laden with flavour not only from ginger, nutmeg and cinnamon, but a nuttiness from barley flour and pureed black eyed peas. Now black eyed peas (also called cowpeas) are a bit of a divisive food around here - at least when they're in a savoury application. I happen to love their nutty, buttery flavour and soft texture, particularly when pureed into a dip or roasted. However, my mom is strictly against this type of legume when she can taste it distinctly - pureed and baked, though, she's willfully blind. The application of a spicy, soft cookie is the perfect foil for the beans, as it allows them to impart a subtle taste without screaming "BEANS HERE!". They passed the "kid test" at school with flying colours too - definitely cookie platter material. I used pear sauce and carob in this revamp of an old family recipe, which happens to be completely vegan! Well, holy crow it's been a while since I've been able to post! With the flurry of activity around here the past few weeks, cooking, baking and writing for the blog had to take a bit of a backseat, so here's hoping the worst of the craziness is past (except for exams... I have no control over those). In the past month, both my stepsister and stepsister-in-law had beautiful baby girls, we had Thanksgiving and Halloween, I got my exam schedule and started my term papers - all of which come with time constraints and stress! When I finally did get into the kitchen, I knew 100% it was going to be in order to make some comfort food. I've written before about my mom's "black box" collection of recipe cards and cache of cookbooks - some gleaned from family and friends, others clipped from newspapers and magazines. Almost none of the handwritten cards have a source, but given the time it would have taken to compile the collection I'm confident that each one had special meaning. This cake was simply titled "Nana's Applesauce Cake". Neither I, nor anyone I know in my family, have ever called our grandmothers "Nana", but apparently somewhere down the line there was such a woman making a spicy, dense, moist ring cake with applesauce. With a boatload of pureed, lightly sweetened pears in my freezer (left over from the days of Ruby Pears in a Golden Cage), I saw this cake as the perfect opportunity to use them up, and take a little twist on tradition as I went along. The neat thing about this recipe is that it was always a 100% vegan and part whole grain recipe - why, I don't know (except maybe economics played a factor), but they definitely don't have any negative impact on the flavour or texture of the cake. I did add a dash of vanilla, and cut down the sugar a bit, but I also decided to use carob in place of the cocoa in the original. Carob has a somewhat fruity flavour going for it, which I thought would work well with the fruit in the batter. I tried to get a photo of it sliced when I took it to work, but (as with all staff rooms) good food simply doesn't linger! I do promise you though that the crumb is dark, moist and definitely indulgent, perfect for pairing with a cuppa on a cold Fall day. Heat oven to 350F and grease a 12-cup tube pan. 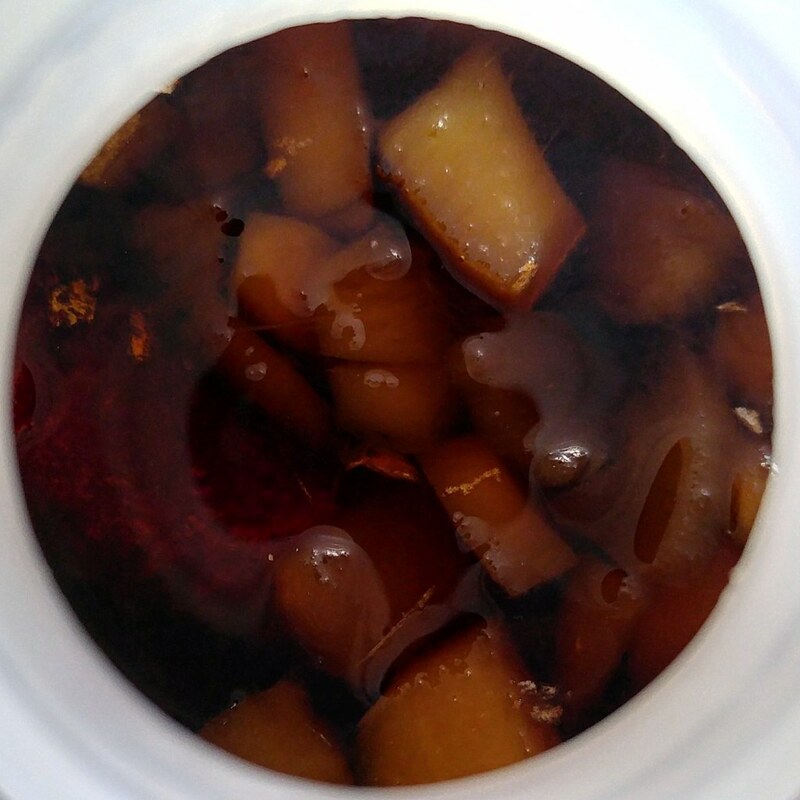 In a bowl, beat together oil, vanilla, applesauce, ginger, nutmeg, cloves, cinnamon, carob, salt and sugar. Add flours and baking soda, beating well. Mix in the dried fruit. Bake at 350 for about an hour or until toothpick comes out clean. 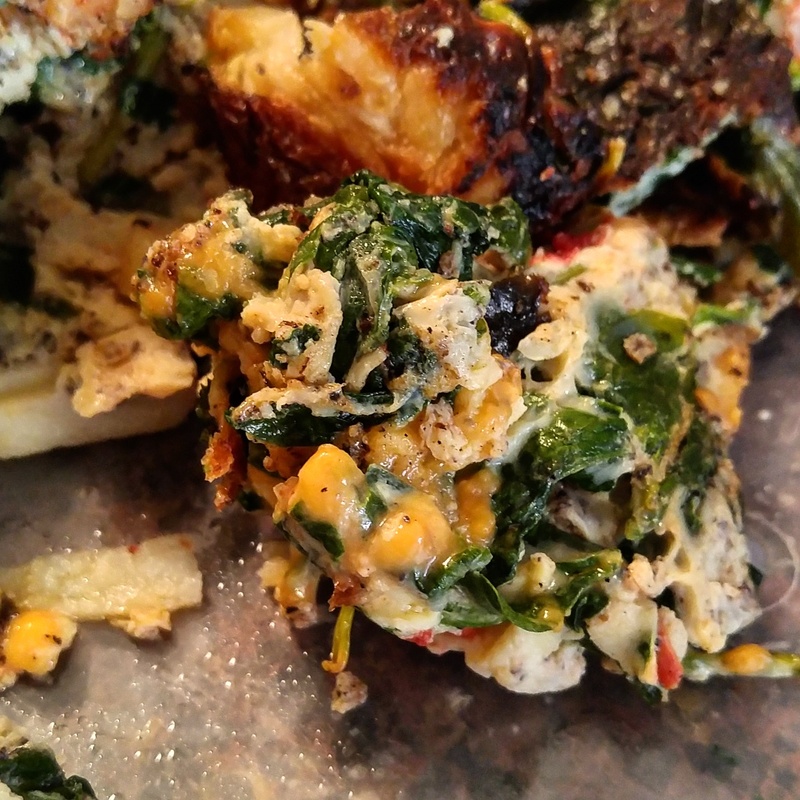 Cheese and eggs combined with roasted potatoes, spinach and tomatoes make for a fantastic all-in-one meal. It's no beauty but my Grade 7s and is ate it up! Eggs are a tricky sell - to kids and adults. Growing up, I would eat eggs one of three ways: scrambled with gratuitous amounts of cheese, as an omelette with cheese and some kind of meat (chorizo was the bomb) or fried, sunny-side-up style, in butter. Plain scrambled eggs held absolutely zero pull for me (and lets not even get into hard boiled ones - I still can't stand their smell). Nowadays, the only person I know who actually likes eggs without anything but a splash of milk is my sister. Everyone else either won't eat them or has to add tons of ingredients for flavour and texture. The lesson plans I wrote for my older Home Ec students were intended to teach them how to cook actual meals for themselves and their families, as they'll be off to high school soon. Hedging my bets that I could convert some of the "egg haters" by adding other elements they did like, I came up with a variation on both an Italian frittata and a Spanish tortilla - a stovetop frittata packed with spinach, potatoes and cheese. While I thought the spinach was a bit of a crapshoot for my traditionally veggie-phobic students - it was so green - I got no complaints either before or after they had their meal. I will admit, though, that the potatoes were the key ingredient - every kid there loves them. Regardless, the plates were cleaned - it's hard to argue with potatoes and cheese on any scale, and the eggs just hold everything together. The one thing I will emphasize is that salt is especially important here - between the potatoes, spinach, tomato and eggs, there isn't enough from the cheese alone. Pepper, however, is to taste. The student I had measuring the pepper added a half tablespoon to the mix in place of the half teaspoon indicated in their copy of the recipe - the results were by no means inedible, but they did require a lot of requests for water! The few leftovers I had, I brought home to my mom. She's not a huge egg eater either, but like the kids if you add enough yummy things to them it's simply a bland binder. The pepper was a surprise, but again, not overpowering, and when served alongside a slice of that week's Cranberry, Walnut and Wild Rice Loaf it made for a very satisfying lunch indeed! 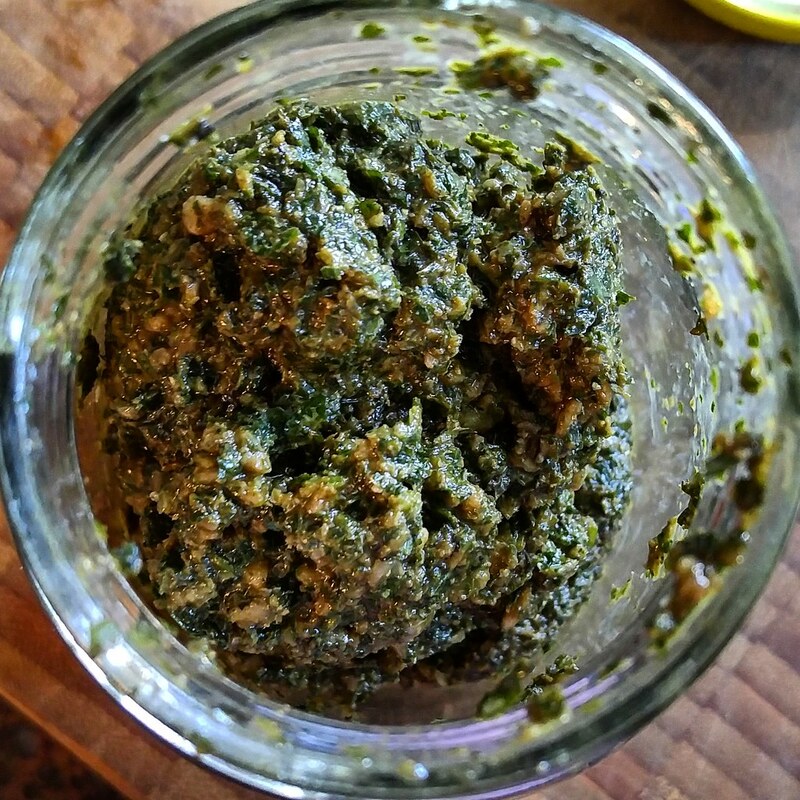 Nut free, vegan, soy free and gluten free - this garlicky basil-lemon balm pesto has it all! Confession: I'm not that into pesto. Something about the nuts (I hate pine nuts as a rule, and walnuts aren't really our thing either) and the over-processed, super-oily herbs always turned me off of the storebought stuff, so when I encountered it on a restaurant menu I naturally avoided it. The other thing I found about pesto (similar to commercial hummus) is that it simply wasn't garlicky enough. I eat garlic like crazy, and since the overwhelming oiliness and pine nut bitterness always seemed to dominate I never got more than a whisper of it when it was in a bowl of pasta. However, as I began cooking for myself and growing my own herbs, I realized that the basil-oil-pine nut-cheese formula was a guideline, not a hard and fast rule. I also realized that what should happen with pesto, what doesn't usually happen with the jars on the shelf, is that the herbs should be the stars. Sure, cheese and nuts are nice, and fruity olive oil is delicious, but with lackluster herbs (or poor treatment of good ones) there is nothing that will make the paste worth indulging in. I had to put the garden to bed this past weekend, which meant hauling out all the dead tomato plants (*tear*) and cutting back the herbs. This gave me a lot of fresh basil and lemon balm, more than I could scatter on pasta or make tea with for a lifetime, so I thought I would combine the two to make a pesto perfect for the upcoming holiday season. In place of nuts (which some of my friends can't eat) I used sunflower seeds, added a lot of extra garlic and a dash of lemon juice to keep the colours and the flavours vibrant. I had initially intended to add nutritional yeast instead of cheese (which I can't eat), but got so into tasting and making sure the consistency was what I was looking for that I simply forgot to add it. The flavour didn't suffer - in fact the herbs popped even more, and by using just a few tablespoons of extra virgin olive oil in the balance of canola I got the flavour without the overwhelming fruitiness. I opted to keep the pesto on the thicker side, so that when it was added to something like pasta the cooking water would loosen it to the proper texture without being oily or soupy. A tiny scoop mixed with freshly cooked rice and roasted carrots (the carrot and beet glut is another story!) needed no extra liquid at all, and I thoroughly enjoyed the fresh, slightly citrusy flavour I got, with a definite pop of garlic and just a whisper of olive. Are you a pesto fan? What's your favourite kind? Nothin' better than a nice warm bowl of homemade, vegan Habitant soup! Comfort food plus... And it's both good for you and your wallet to boot! Habitant soup and I go way back. In fact, its one of the first soups I ever remember eating - curled up on the couch with a pepper shaker and splitting the whole can of soup with Grandpa. Bowls of it got me though the chicken pox, countless ear infections and flus, even a nasty bout of mononucleosis in highschool, and none of my friends could understand the allure. In fact, my mom's family and I were the only people I knew growing up who would eat it... everyone else's loss, I say. 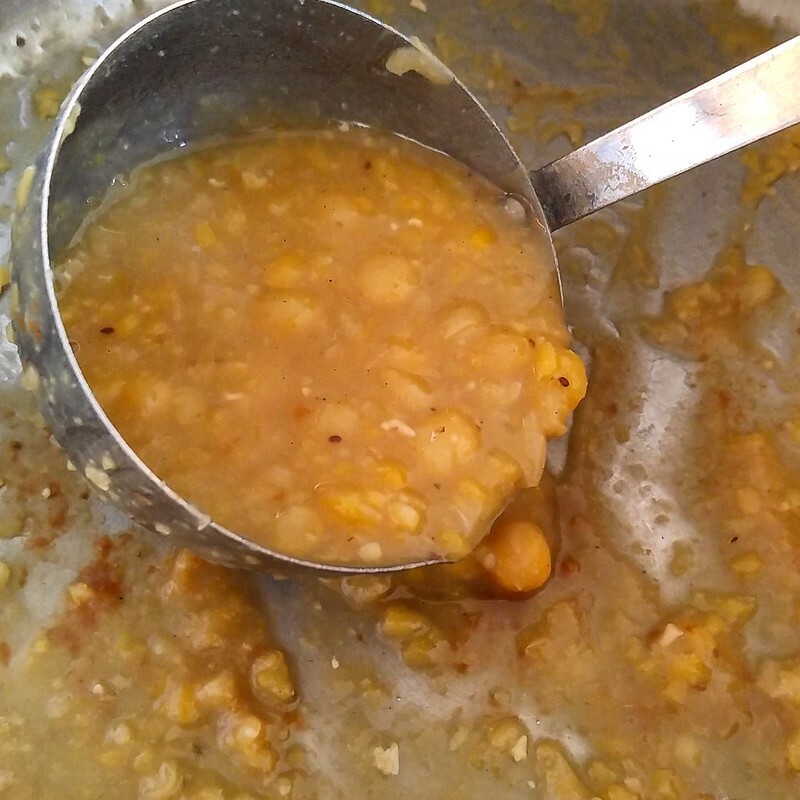 After all, it was essentially soft-cooked, stewed yellow peas in a bowl - old people food. But for me, it wasn't just peas in a bowl. Something about its buttery flavour (accented perfectly with lashings of black pepper), the soft-yet-textured body and its ability to warm you all the way through and fill you for more than an hour earned the soup a special place in my heart. The French Canadians had it right with this recipe, and somehow the care and love the original cooks back in the 1800s put into their pots translated through time (and cans) to our table. Sadly, being an old, French Canadian recipe, my beloved yellow cans contain lard - something my digestive system can no longer handle. I had tried other, vegan split pea soups, but the texture was off and flavour lacking. I knew whole peas and simple flavours were the way to go, and after searching for what felt like eons I came on a recipe by a Canadian canning company. I was confident that, having been written by a Canadian, it would be as close to the "real stuff" as possible. I did have to ixnay the pesky ham, though, and I wanted to accent the savoury flavours, so I took a leaf out of Bryanna Clark Grogan’s recipe and added allspice and liquid smoke, plus cumin because I love it. The key to getting the consistency of silky puree with bits of pea while adding the flavour from the carrot and onion was to add the vegetables "stock style" - leaving them in big chunks and removing them like the bay leaf after they've given up their essential nuances. The tiny bit of liquid smoke nailed the hint of bacony aroma from the original, all while keeping the recipe oil free. The best part was that it made a bunch and canned perfectly in my pressure canner, so I put up a bunch of pints (perfect "for one" size) to enjoy over the winter. I can't wait to make it again - it's pure comfort food. Speaking of comfort food, our #SundaySupper gang is all about the comforting soup and stews this week. Be sure to check out all the offerings below, and say hi! Do you have a soup that evokes special memories for you? Let me know in the comments! Habitant Pea Soup by What Smells So Good? This crusty, delightfully chewy whole grain loaf is loaded with Canadian flavour, and is so hearty that a slice of two are great for packing on a hike or long car ride. I can't believe it's been another year. I love the annual World Bread Day roundups by Zorra, and always do my best to come up with a loaf to share. I have to admit, though - I almost didn't make it this year! I'm in the middle of writing term papers for the first year of my sociology program at university (yup, back at the education thing again) and this blog (and cooking in general) has sadly been shifted to the back burner. It's not quite stuck in the warming drawer, but for a little while at least my posts definitely won't be as frequent. However, when the school thing with all its deadlines, coupled with the work thing and it's responsibilities, gets just too much, I bust out the breadmaking routine. Nothing eases tension like crafting loaves of bread. Its such a soothing, creative process... and a tasty one at that. This time around I settled on a very "Canadian" themed loaf inspired by a chef on the TV channel Gusto. 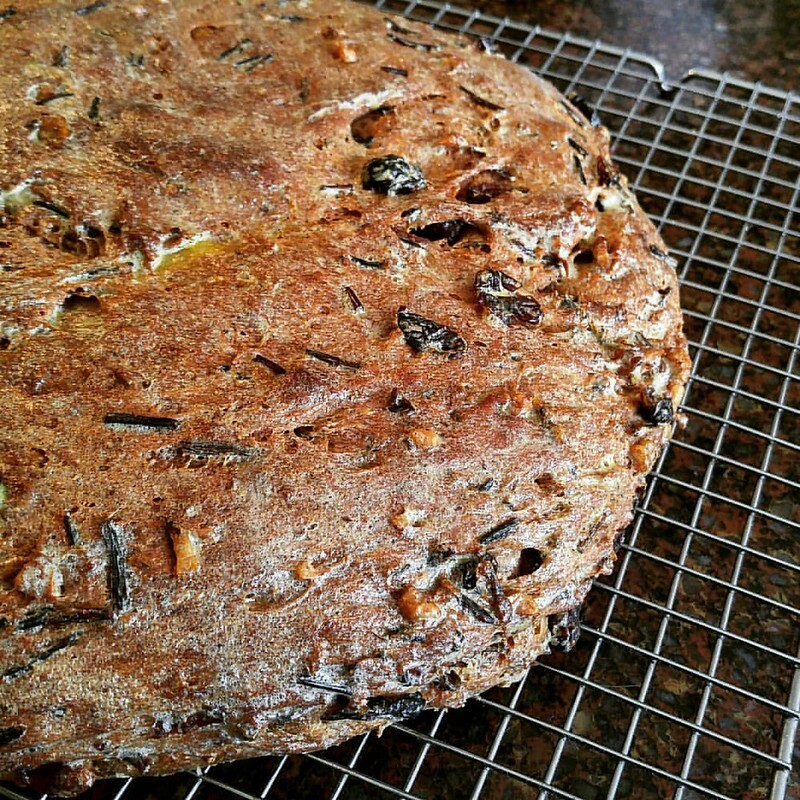 The original bread is a lofty boule with chopped walnuts and cooked wild rice. Mine, although it didn't rise as high, had the added flavour elements of flaxseed, dried cranberries and walnut oil, and uses less honey in favour of the addition of maple sugar. A slice of it, smeared with walnut-almond butter (we just mixed walnut and almond butters together) makes for a chewy, stick-to-your-ribs breakfast that's full of brain food for the day, Omega-3s and complex carbs to keep you going. For lunch, I ate the leftover wild rice with the dried cranberries, garlic and mushrooms, because why not? The best part about this loaf is that its a big one, so I know that I'll have lots of leeway between bake fests. As much as I hate to put them off! Whisk together the water, milk, honey, sugar and oil in a cup, set aside. In the bowl of a stand mixer, mix together the flours, flaxseed, yeast and salt. Add the liquid ingredients and knead with the dough hook until smooth and elastic, about 8-10 minutes. 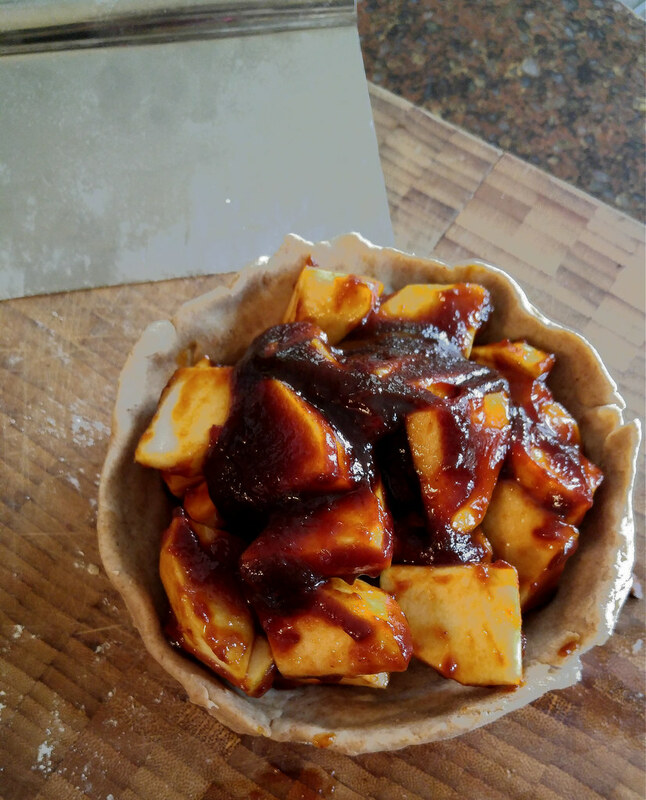 Place in a lightly oiled bowl, cover and let rise until doubled, about 1 ½ hours. Punch dough down and knead in rice and walnuts. Shape into a round and place on a cornmeal-dusted, rimless cookie sheet. Cover and let rise until doubled, about 30 minutes. Heat the oven (ideally with a baking stone) to 375F. Slide loaf off the sheet onto the stone (or place sheet in the oven) and bake ~50 minutes, until it registers 200F. Remove from the oven and allow to cool on a wire rack. Didn't bake a bread but want to see all the goodies? Look out for the hashtags #wbd2017 #worldbreadday and #worldbreadday2017 on social media, and check out the founder Zorra's instagram at @zorrakochtopf! You can also follow me, you know - I'm right here.